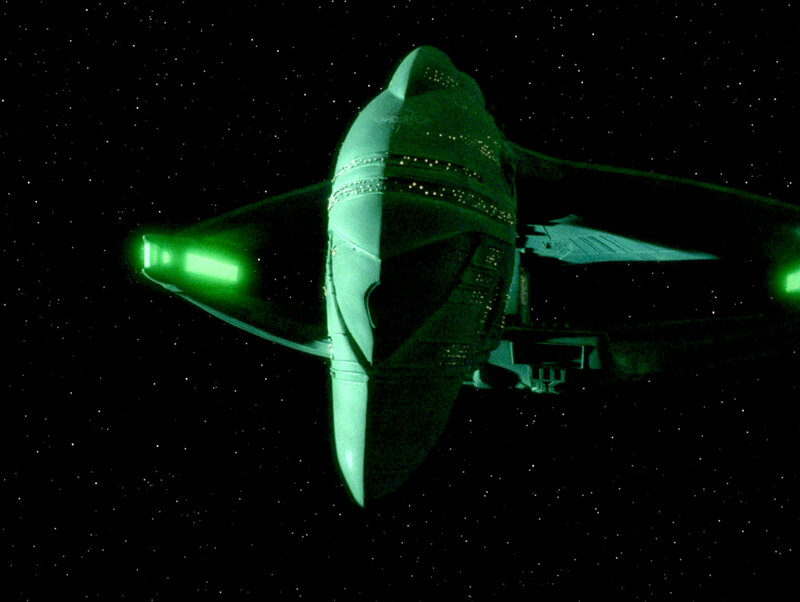 The Romulan Warbird of the D'deridex class made its first appearance late in the first season of TNG in "The Neutral Zone". 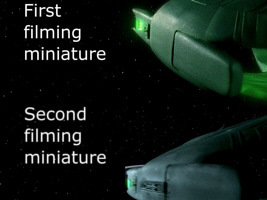 For that episode, a filming miniature was built by Greg Jein. This filming miniature was in use for the first 2½ seasons of TNG, although not much footage was filmed using the model. Stock footage was often employed for the early appearances of the ship. 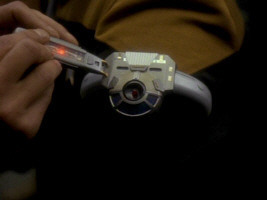 For "The Defector", a second physical model was constructed. 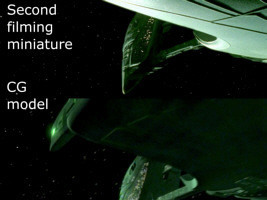 This model differed in some small regards from the original filming miniature. 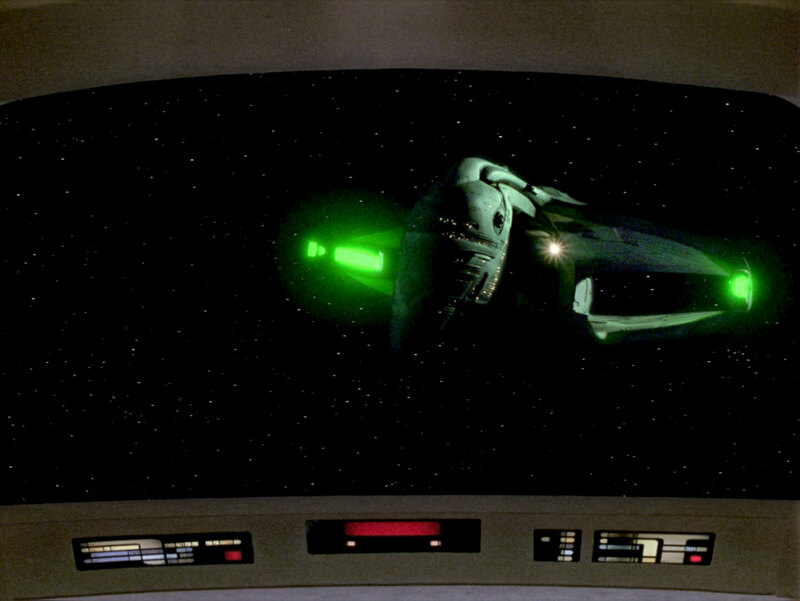 This model had additional details on the sides of the nacelles, which were completely unadorned on the original filming miniature. 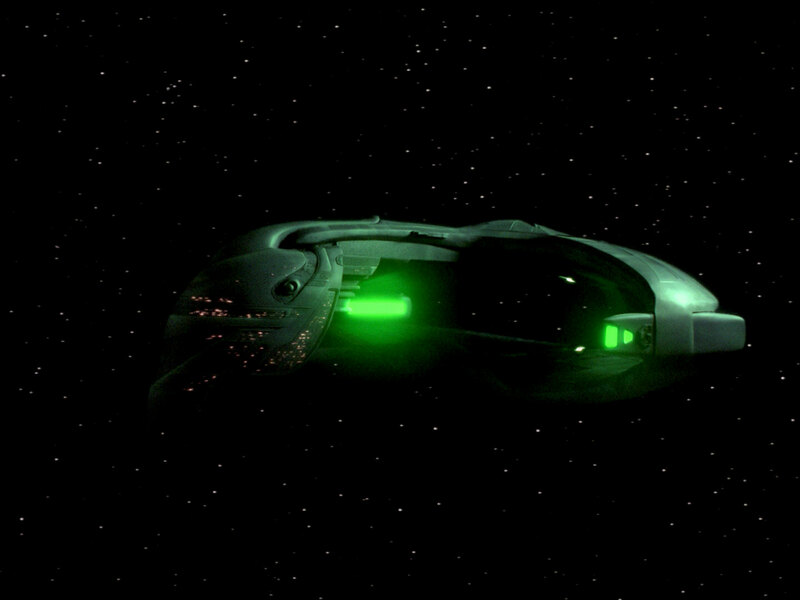 This second version of the ship can also be distinguished by additional window lights, most noticeably on the curved section at the very top of the front of the ship (basically the "forehead" of the bird's head.) 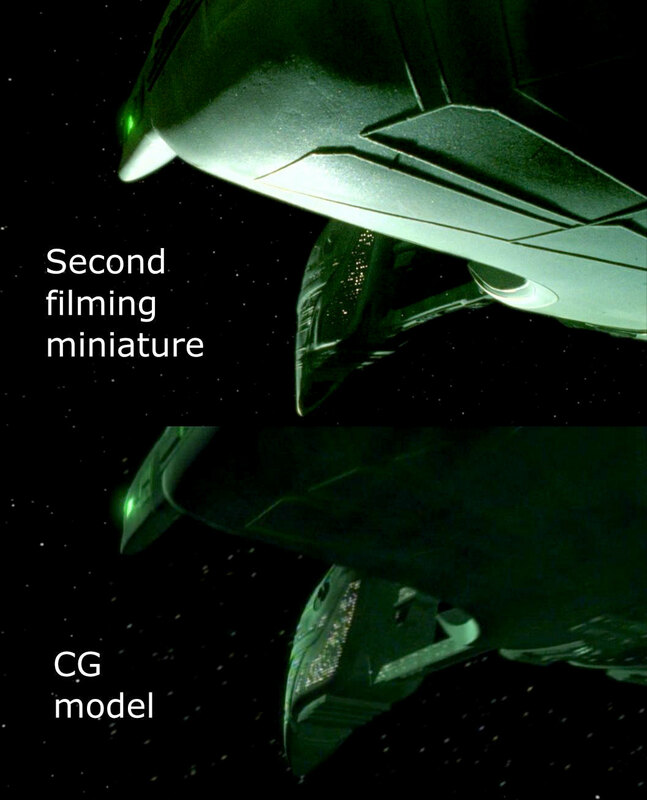 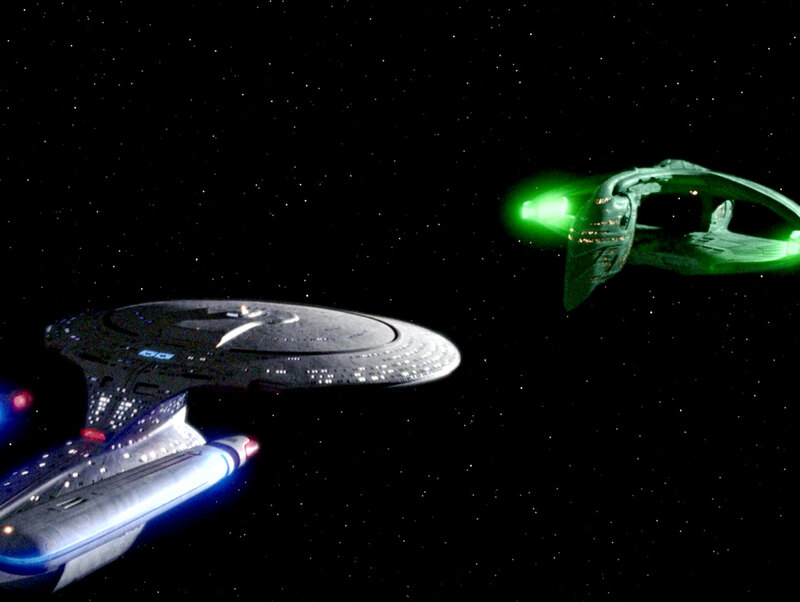 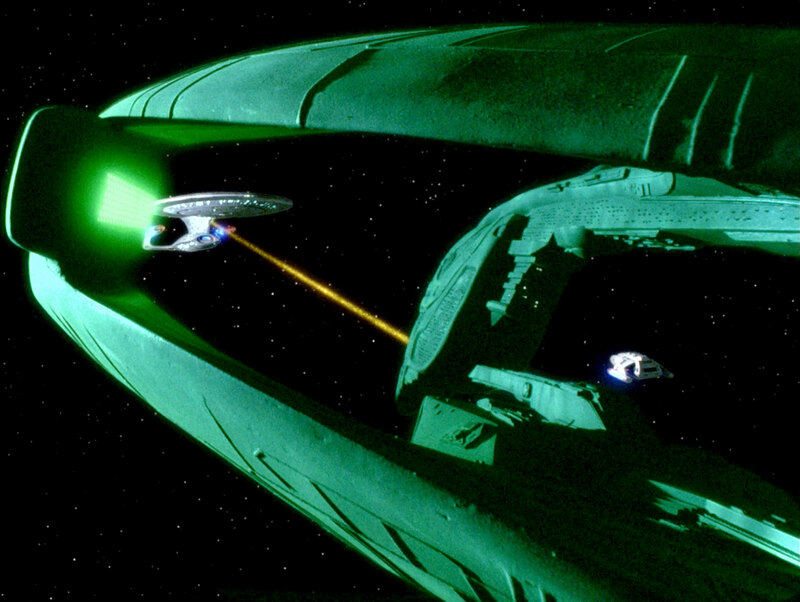 After this second model was introduced in "The Defector", the original filming miniature was never used again, except for stock footage seen in some later TNG episodes. 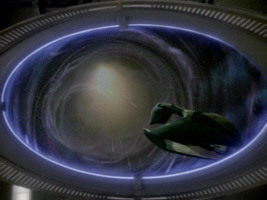 The second model was in use until DS9's "The Die is Cast". 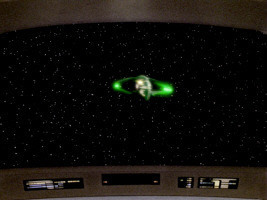 After that, either stock footage of the model was used or the new CG model, created for VOY's "Message in a Bottle", was used on DS9. 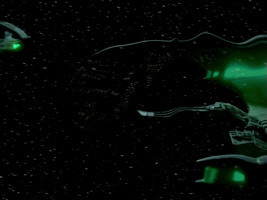 This model can clearly be distinguished from the physical models as it does not feature any lights in the aforementioned section of the "head" of the Warbird. 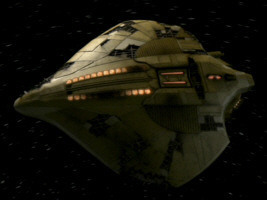 A large chunk of the CG model of the ship was later used to represent a new alien ship on Star Trek: Enterprise – the Mazarite warship in "Fallen Hero". 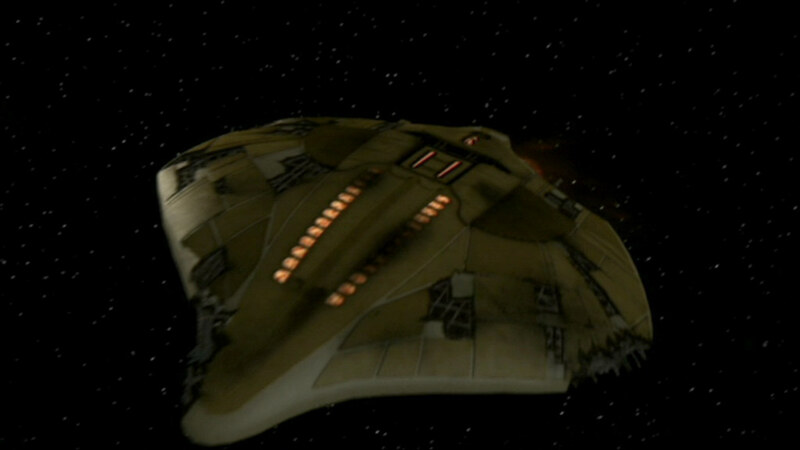 The same CG model was later re-used once more, as the Illyrian starship in season 3's "Damage". 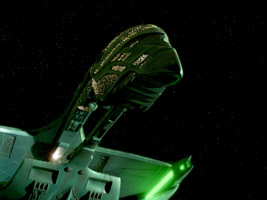 In the following article, we trace every appearance of any version of the Romulan D'deridex class, list which model was used in a given episode, and identify any stock footage that was employed. 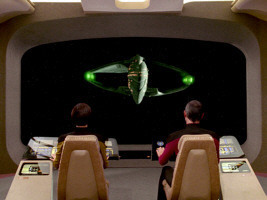 Whenever possible, HD screenshots are shown. 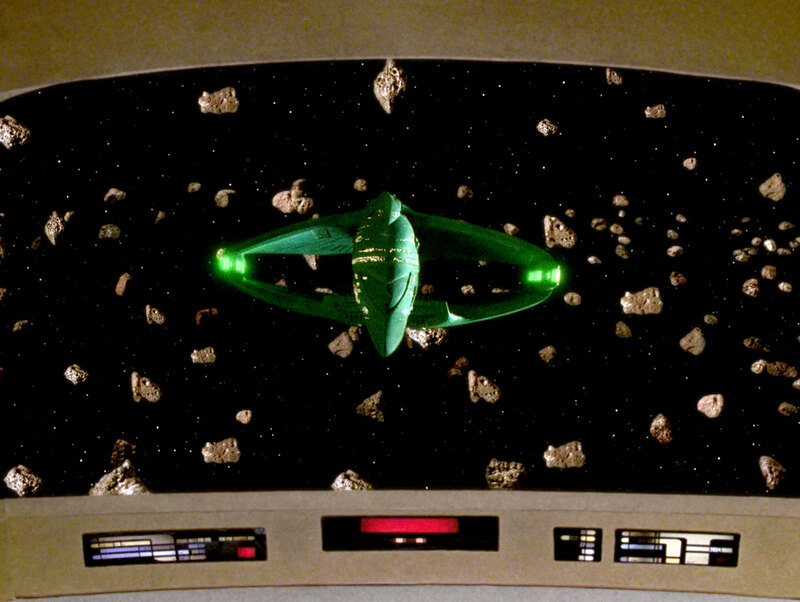 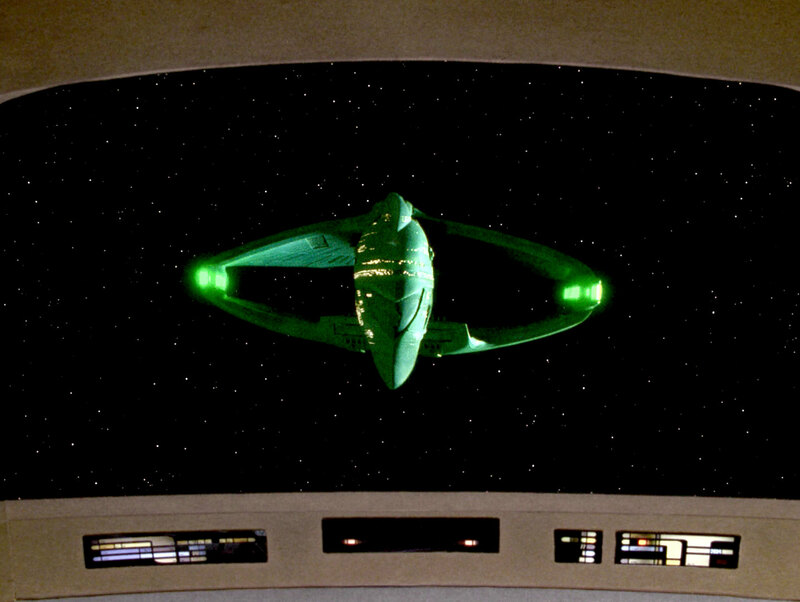 The Romulan Warbird made its great, first appearance in the final episode of the first season of TNG. Many shots filmed for this episode were then re-used in later TNG episodes. 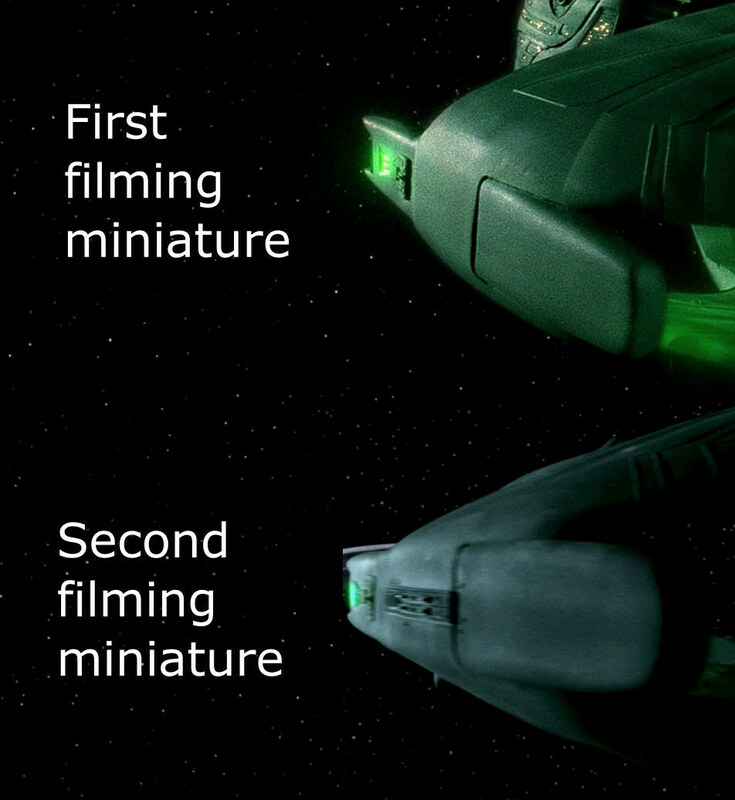 The episode features four distinct shots of the first filming miniature. 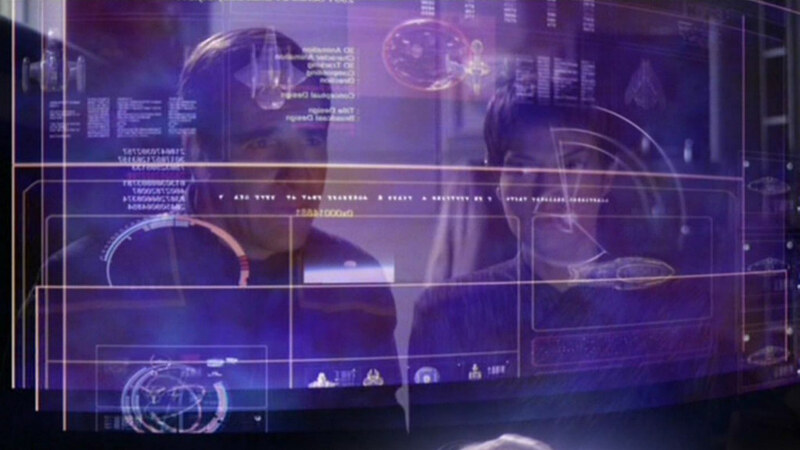 In the first shot, the ship is seen decloaking on the main viewscreen of the USS Enterprise-D (A). 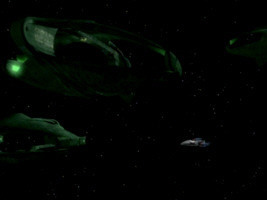 The second shot shows the ship flying from the right to the left, so the port side is seen (B). 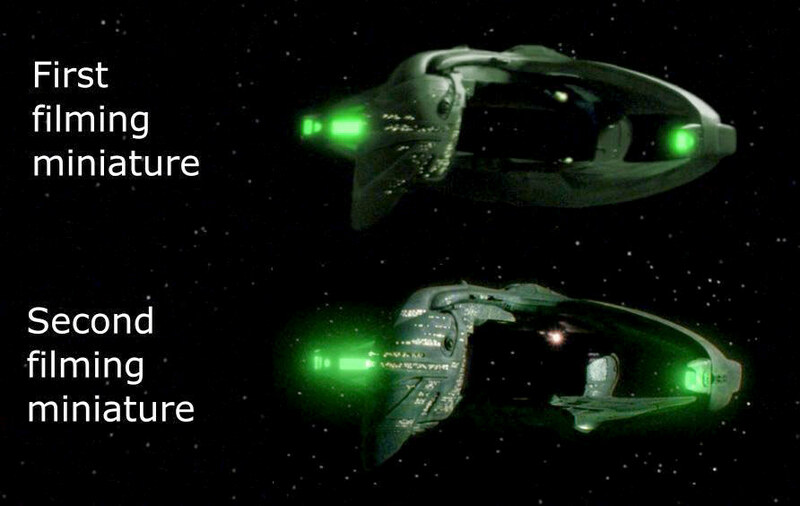 The third shot is the most often re-used shot of the ship. 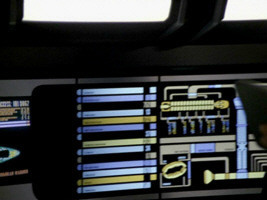 It shows the ship from the front as seen on the main viewscreen of the USS Enterprise-D. In that shot, the ship slowly moves a little (C). 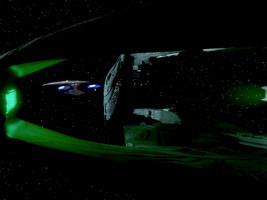 In the final shot, the ship is seen flying away from the USS Enterprise-D, from the left to the right, so this time the starboard side of the ship is seen (D). 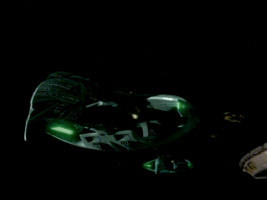 In shots A, B and C, the windows at the top of the "head" of the Warbird seem not to be illuminated, in shot D, which shows the ship from the other side, some of the windows are lit. In all shots, the plain sides of the nacelles can be seen (Details on the first filming miniature). The ship next briefly appears in the second episode of the second season. 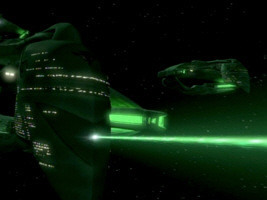 In this case, no real Romulan ship is seen but rather and illusion created by Nagilum. No new footage was filmed for this episode. 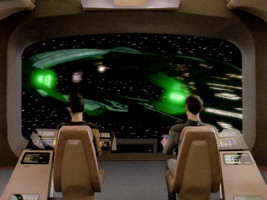 The shot of the ship decloaking (A) and the static shot on the main viewscreen (B) were both re-used from "The Neutral Zone". An image of a Romulan Warbird is briefly seen on a monitor during Data's psychotropic stability examination. 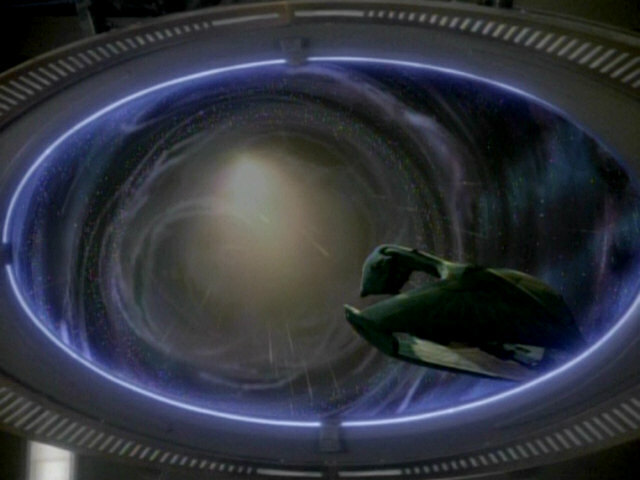 The shot is a re-use of footage originally filmed for "The Neutral Zone". 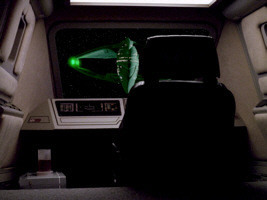 It's the shot that is often used when the ship is seen on the main viewscreen. When the episode was remastered, instead of using HD footage on the small monitor (high resolution footage of the Warbird was certainly available), the whole sequence was culled from the SD version of the episode and simply reinserted. 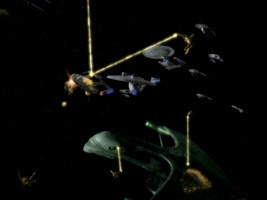 That is why this footage, in the remastered version, is even more blurry than in the original version of the episode. 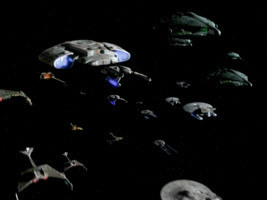 Warbird in TNG: "The Schizoid Man"
Warbird in TNG-R: "The Schizoid Man"
"Contagion" is the first season 2 episode that actually features new footage of the filming miniature. 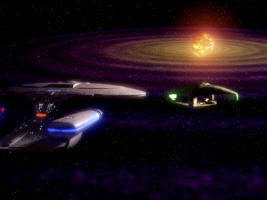 Three new shots were filmed for this episode and three shots from "The Neutral Zone" were re-used. The first shot shows the ship fly from the left to the right (A). This footage was originally created for "The Neutral Zone". 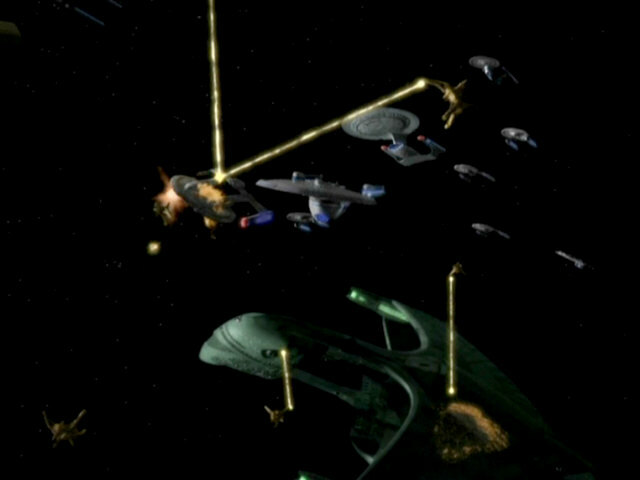 In that episode, a much shorter sequence of that shot was used however. 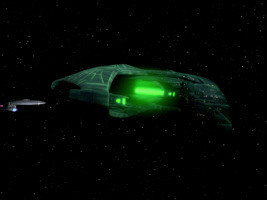 The first part of the sequence, showing the ship from a greater distance, did not appear in the season 1 episode. 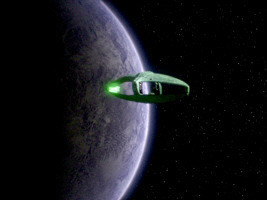 In that episode, the shot lasted longer, however, and the ship actually flew by the camera instead of just approaching it. 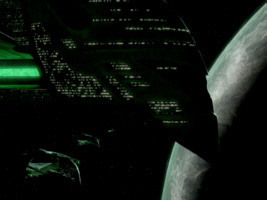 In the remastered version of "Contagion", at least two windows can be seen lit at the top of the Warbird's "head". All other windows are lit much less faint than in the first season episode. The second shot shows the ship slowly fly towards the USS Enterprise-D, as seen on the main viewscreen (B). 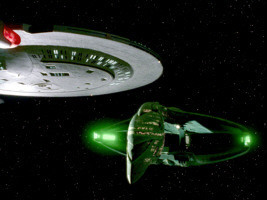 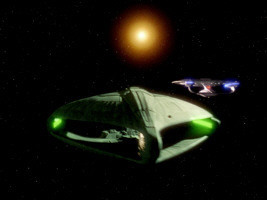 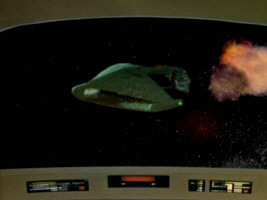 When this footage was used in "The Neutral Zone" and re-used in "Where Silence Has Lease", the ship was seen decloaking. 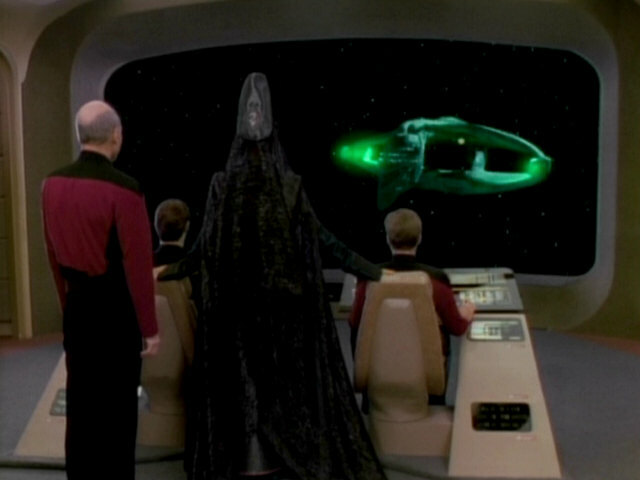 Here, the ship is decloaked from the very beginning. The third shot of the ship appears several times in the episode. 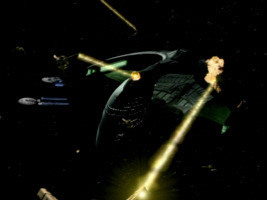 It's the shot that is often used on the main viewscreen (C). 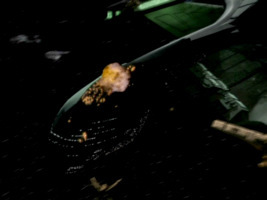 All remaining shots of the Warbird seen in the episode were newly created for "Contagion". The first shot highlights the upper left side of the ship (D). 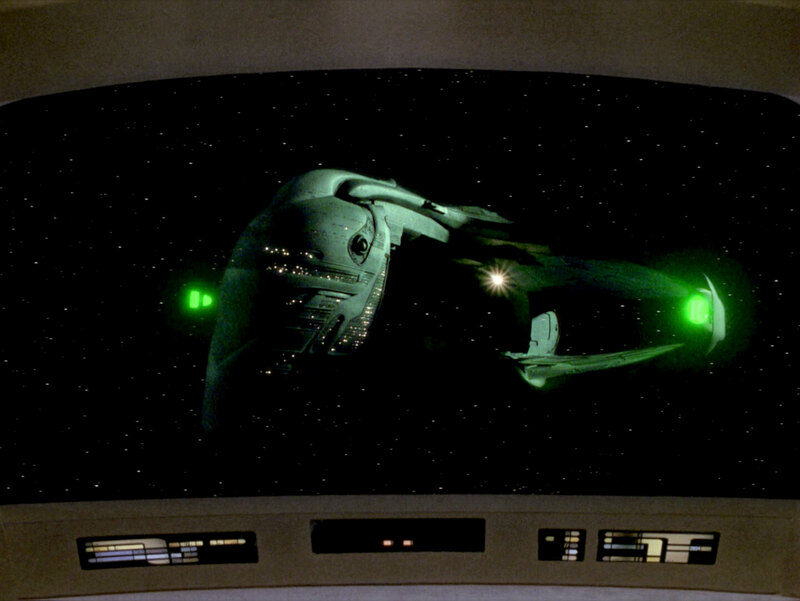 The plain side of the nacelle can clearly be seen again. 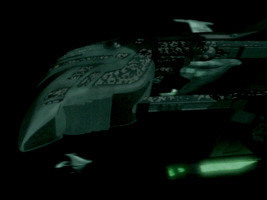 Looking at the top section of the Warbird's head, it can be seen here that this section does indeed feature window holes, even though the light in the windows cannot be seen. 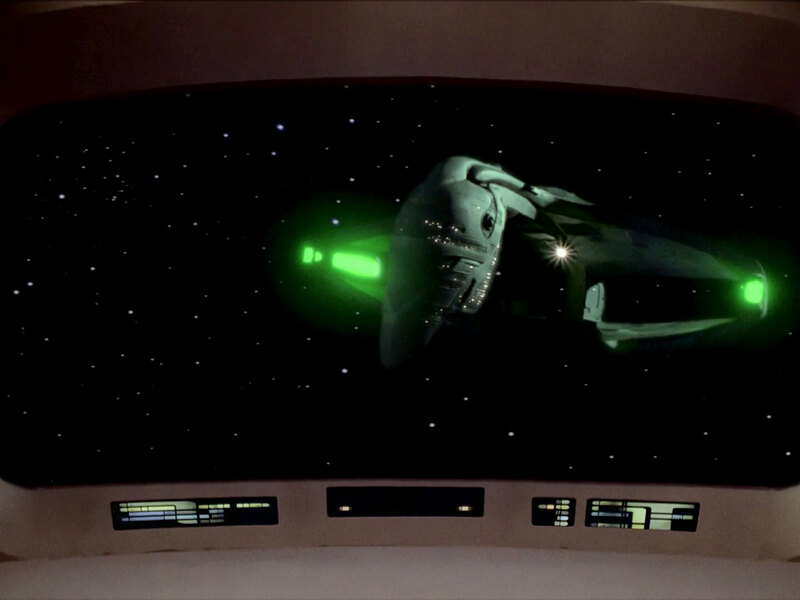 The shots must have been too dark in earlier appearances for the illuminated windows to be seen properly. 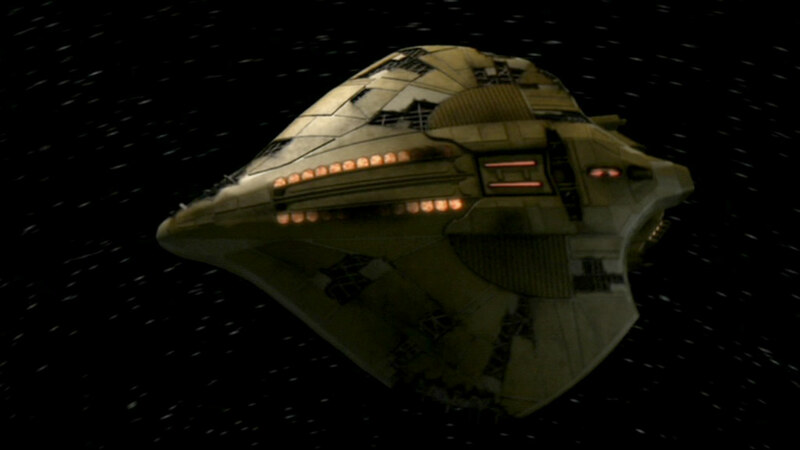 The second new shot of the model shows the front of the ship up close (E). 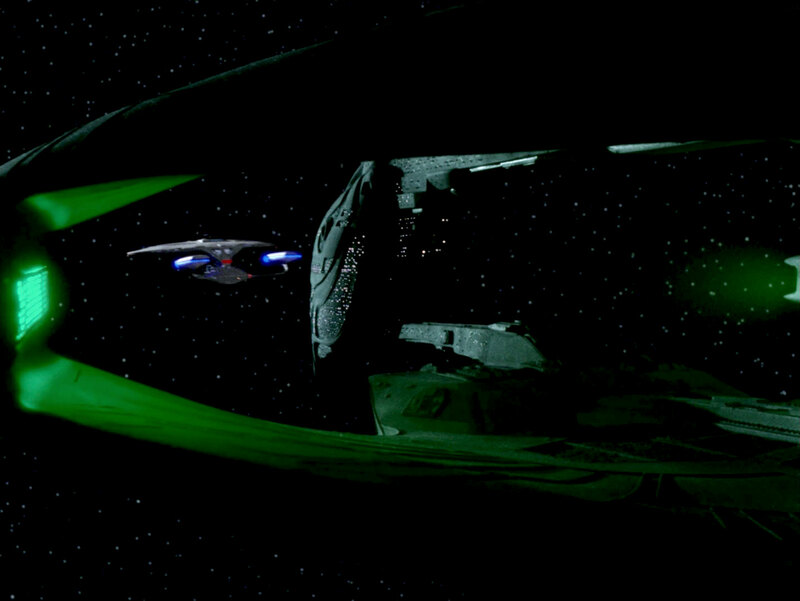 In this shot, the Romulan logo on the front of the Warbird's "head" can clearly be made out for the first time. 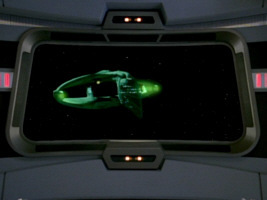 The window slits in the top section of the "head" can clearly be seen and at least one window seems to be illuminated. 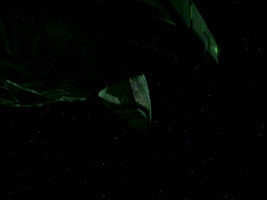 The final new shot seen in the episode shows the Romulan Warbird slowly fly towards and then past the camera (F). 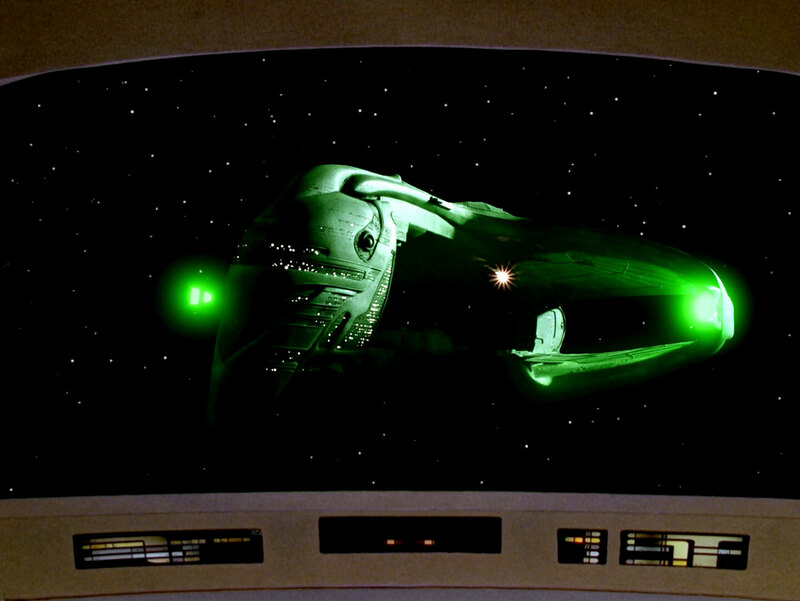 As the ship is seen powering up its engines again, the windows and nacelles are not illuminated at first. 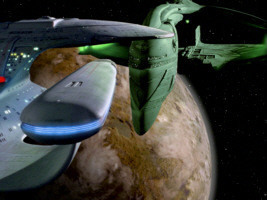 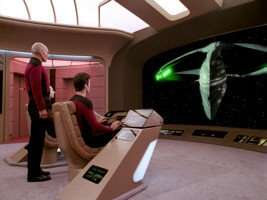 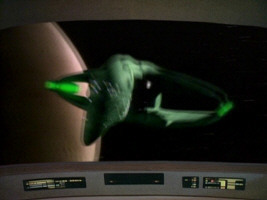 An image of a Romulan Warbird appears in one brief shot on the main viewscreen of the USS Enterprise-D in the episode. 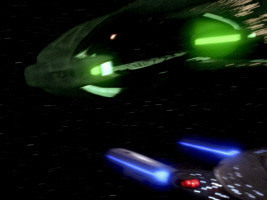 The shot shows the ship quickly flying from the right to the left and is rather blurry. This was the last new footage ever filmed using the first filming miniature, as all later appearances of the Warbird using footage of that model were re-used from earlier episodes. 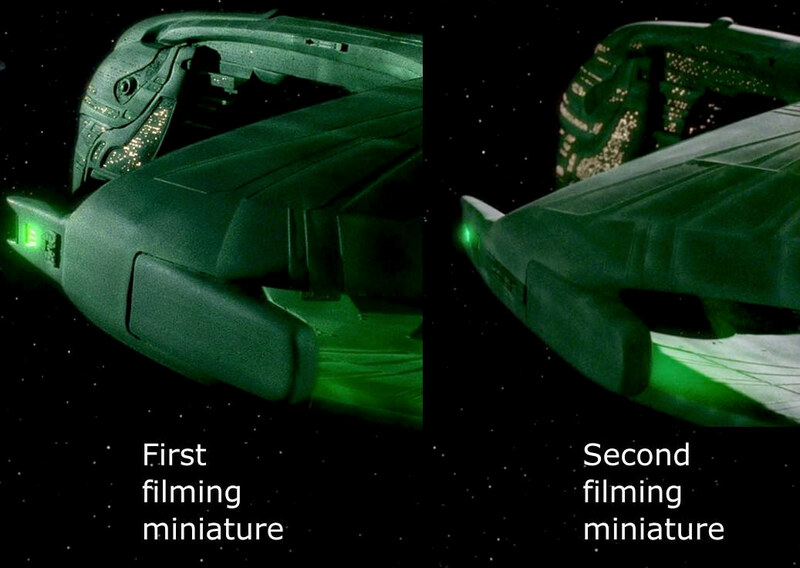 For the three episodes that feature unique footage of the first filming miniature, only eight different shots of the Romulan Warbird were created. 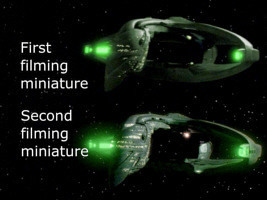 For some reason, after the quick flyby for "Peak Performance" was filmed, the original filming miniature never turned up again. 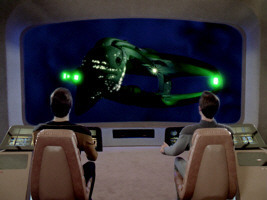 A: The ship slowly approaches the USS Enterprise-D as seen on the main viewscreen. 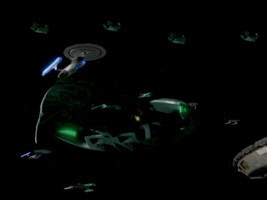 Like in "Contagion", the Warbird is already decloaked. 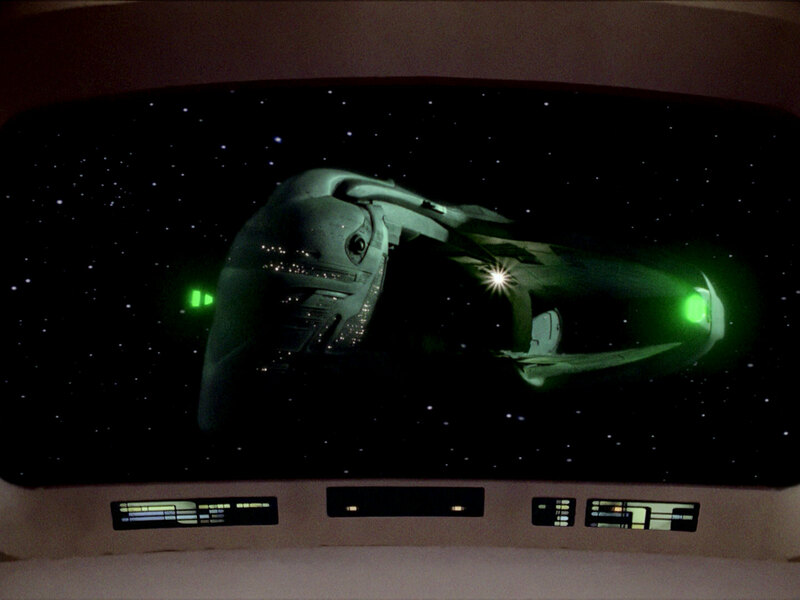 B: The most-often re-used shot of the nearly motionless ship, seen on the main viewscreen. 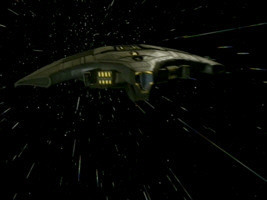 C: The shot showing the ship fly away towards the camera. Unlike the previous two re-uses, this footage was not originally filmed for "The Neutral Zone" but for "Peak Performance". In that episode, the USS Enterprise-D is seen departing (and leaving frame) first, with the Romulan Warbird following shortly thereafter. 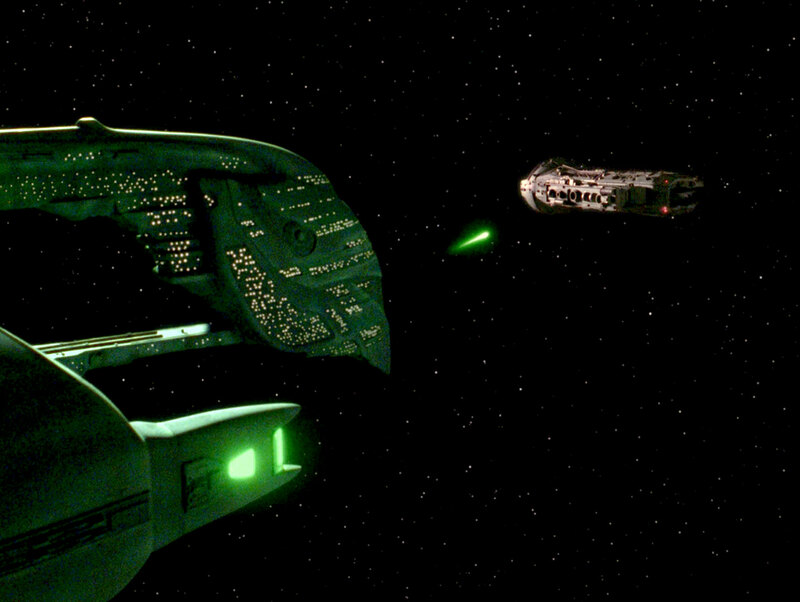 Here, the Romulan ship leaves frame first and the Enterprise-D follows a few seconds later. The second filming miniature of the Romulan Warbird is first seen in this episode. 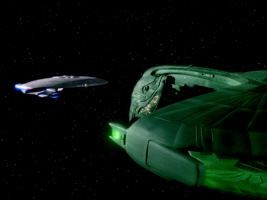 All footage in "The Defector" was especially created for this episode, so for the first time, the original filming miniature does not appear in the episode. 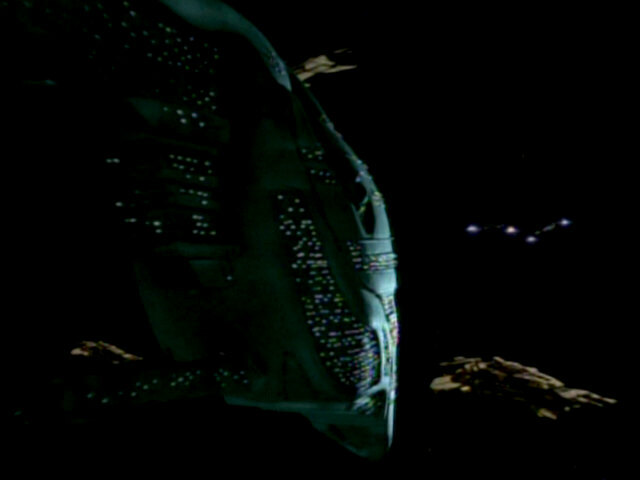 In the first two shots (A+B), the ship is seen flying quickly past the camera. 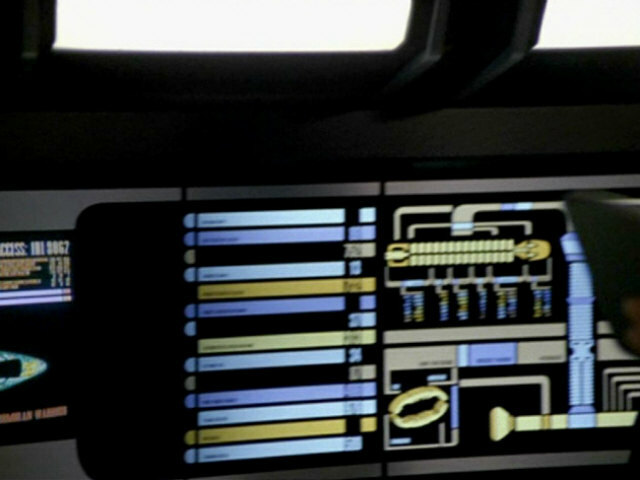 In the first shot, the footage is seen on the main viewscreen of the USS Enterprise-D. 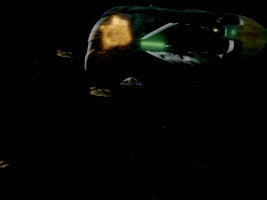 Even in these two blurry shots, however, it can clearly be seen that several rows of windows on the top of the Warbird's head are now brightly illuminated - one detail that distinguishes the second filming miniature from the first one. 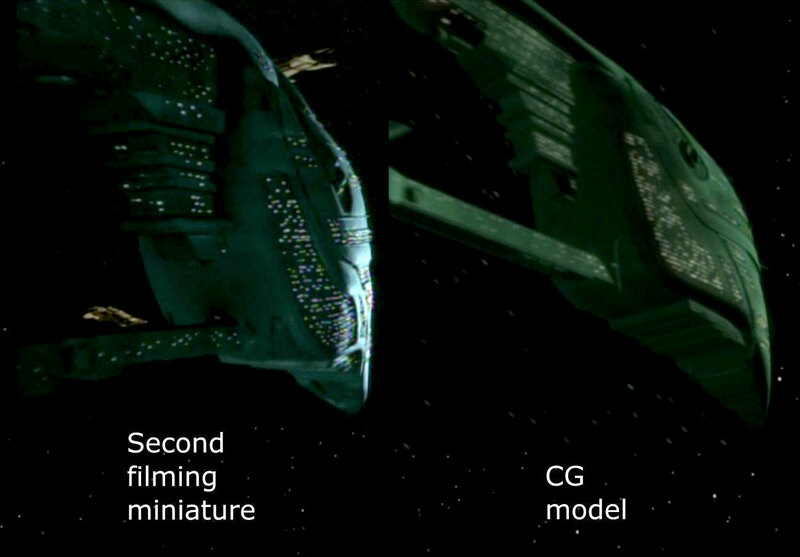 We get our first good look at the new filming miniature in the third shot featuring the ship (C). 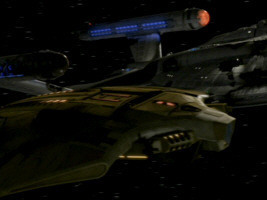 Here, the Warbird is seen flying slowly towards the USS Enterprise-D and coming to a stop. 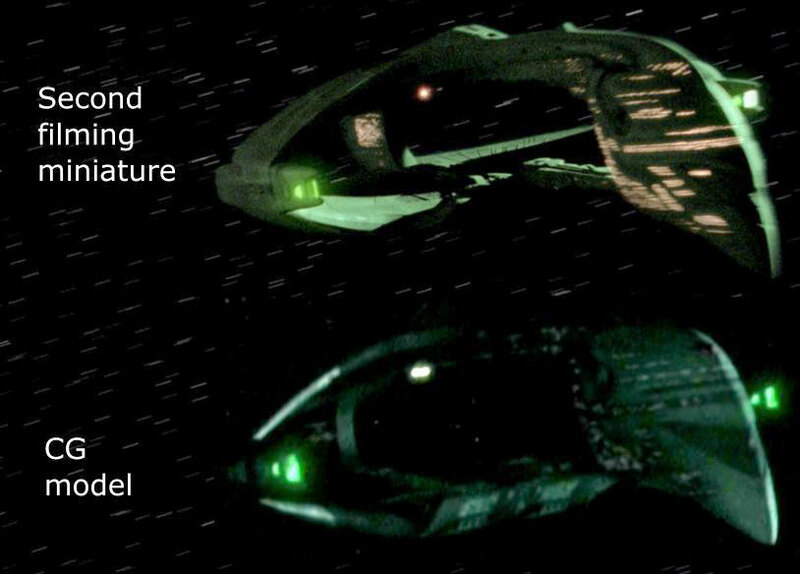 Both features that distinguish the second model from the first one can clearly be seen here: the three rows of illuminated windows in the top section of the Warbird's head and the additional detail on the side of the nacelles (Comparison of the physical models, 1). 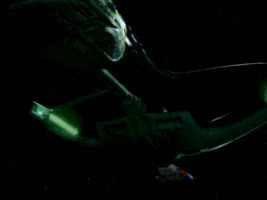 The next shot of the Romulan Warbird that appears in the episode is again seen on the main viewscreen. 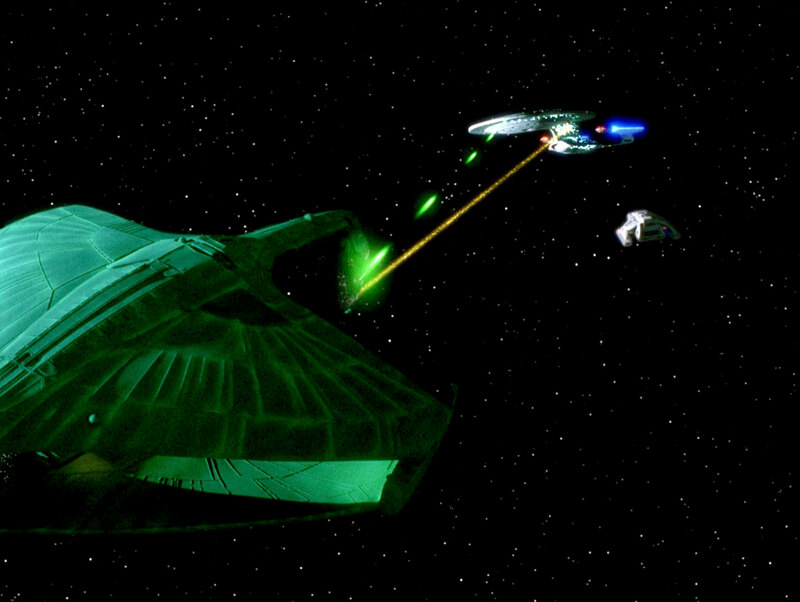 The ship faces the USS Enterprise-D and then flies away to the side while engaging its cloaking device (D). Even though the starboard nacelle passes right in front of the camera, the additional detail can only barely be seen due to the darkness and blurriness of the shot. 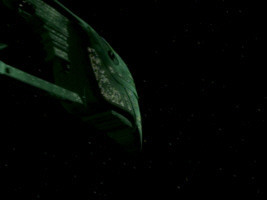 The next new shot (E) appears several times in the episode. 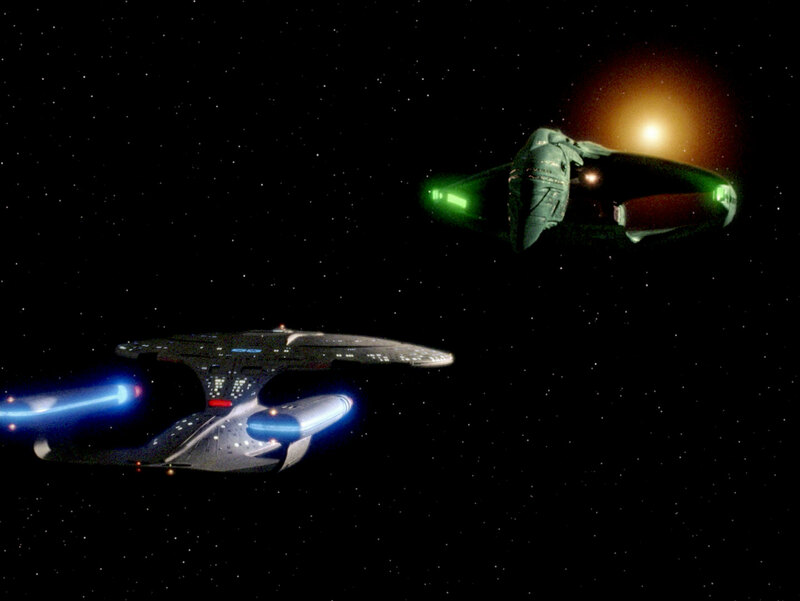 Two Romulan Warbirds are first seen decloaking and then hovering above the USS Enterprise-D. 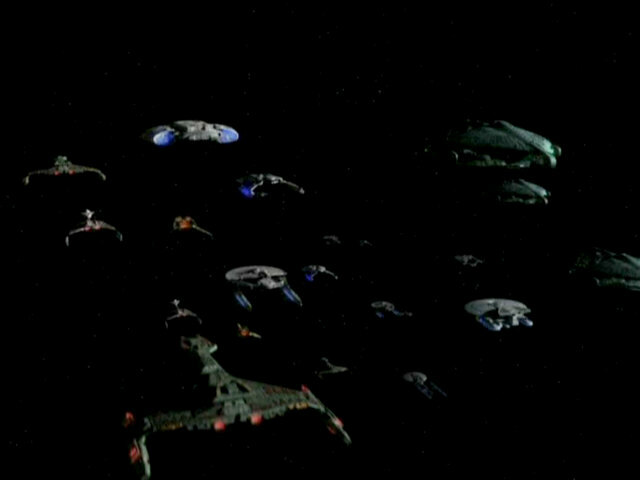 In one shot, the camera is much closer on the ships and then slowly moves backwards as the Klingon Birds-of-Prey decloak. 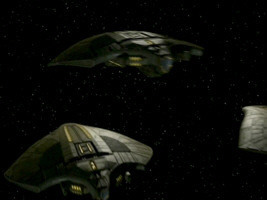 At the end of the episode, the Warbirds are seen veering to the side and engaging their cloaking devices. 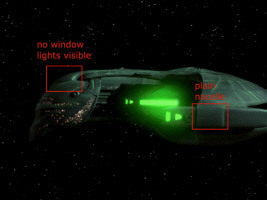 Again, the much more brightly and numerously lit windows, especially at the top front of the ship, can be seen (Comparison of the physical models, 2). 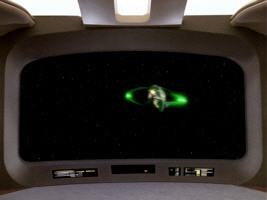 Towards the end of the episode, one of the two Warbirds is briefly seen on the main viewscreen at the end of a conversation. 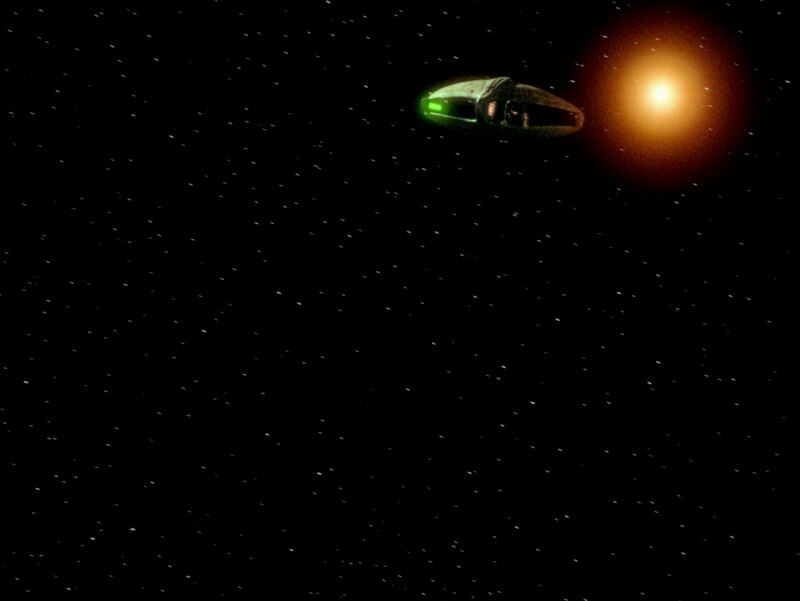 This is re-used footage from earlier in the episode (D), however, flipped horizontally. "Tin Man" is the first episode in which stock footage of the first filming miniature appears alongside stock footage and newly filmed material of the second filming miniature. 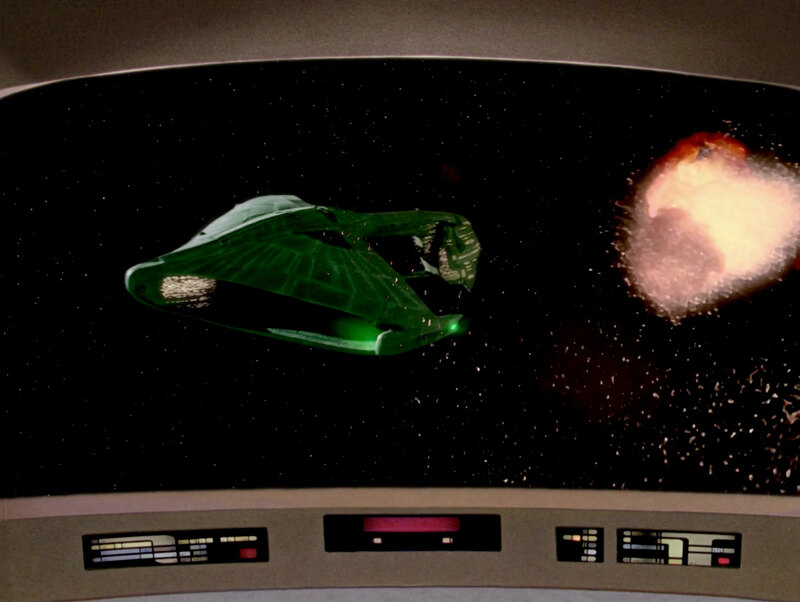 The first shot shows the Romulan Warbird quickly flying from the left to the right on the main viewscreen (A). 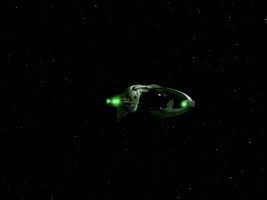 This is stock footage of the new filming miniature from "The Defector". 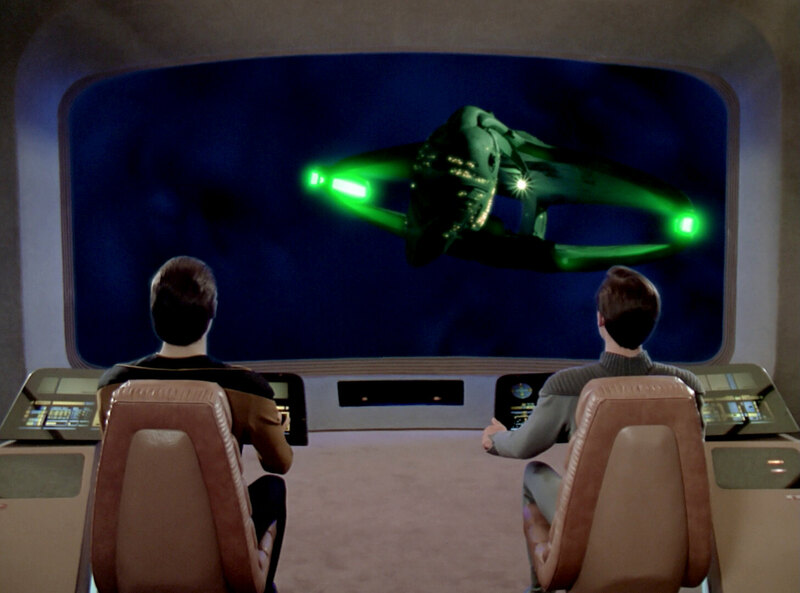 The next shot (B) was newly created for the episode. 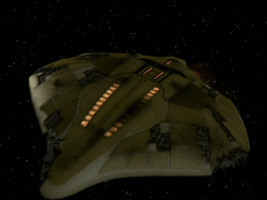 This is the first time the ship is really shown from the back, one of several shots of the ship's stern seen in this episode. 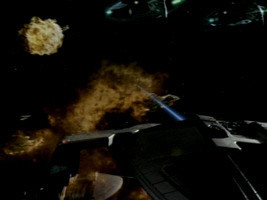 In the shot that follows next (C), the Warbird is seen flying from the left to the right, firing at the USS Enterprise-D. Even though the ship is flying quickly past the camera, the additional details on the side of the nacelle are clearly visible. 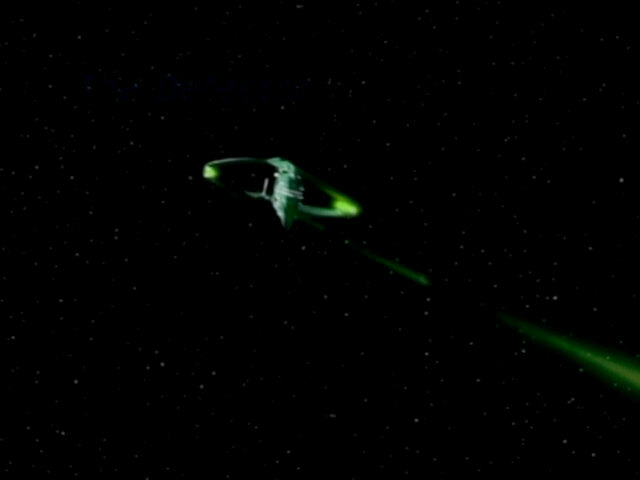 In the next shot, the Romulan Warbird is seen as it is hit by Gomtuu's energy wave (D). The next few shots were all originally created for earlier episodes. 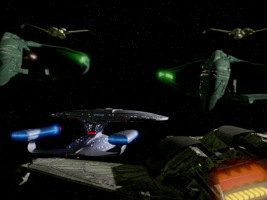 The shot of the Warbird facing the USS Enterprise-D (E) was last seen in "The Defector", where the ship was facing two Warbirds, however. 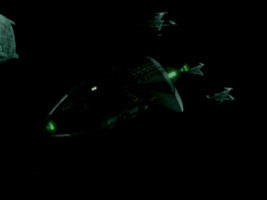 Beta Stromgren was added for this re-use of the footage. 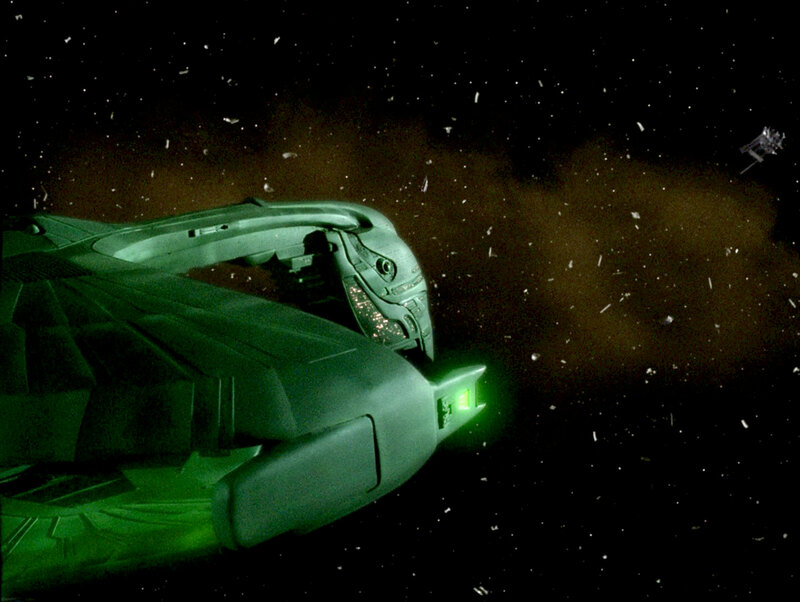 A frontal shot of the Romulan Warbird originally created for "The Defector" (F), the beginning of a sequence showing the ship fly away, appears briefly on the main viewscreen before and after a call from the Romulan ship. Again, Beta Stromgren was added into the footage for this re-use. 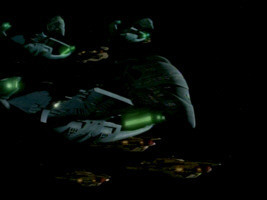 This is followed by the only shot of the original filming miniature seen in the episode, stock footage from "Contagion", without Iconia, of course (G). 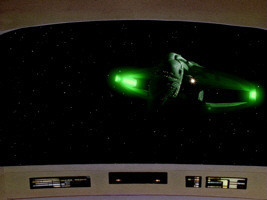 The missing window lights at the front of the ship and the lack of details on the side of the nacelle quickly give this footage away as having been filmed with the first filming miniature. 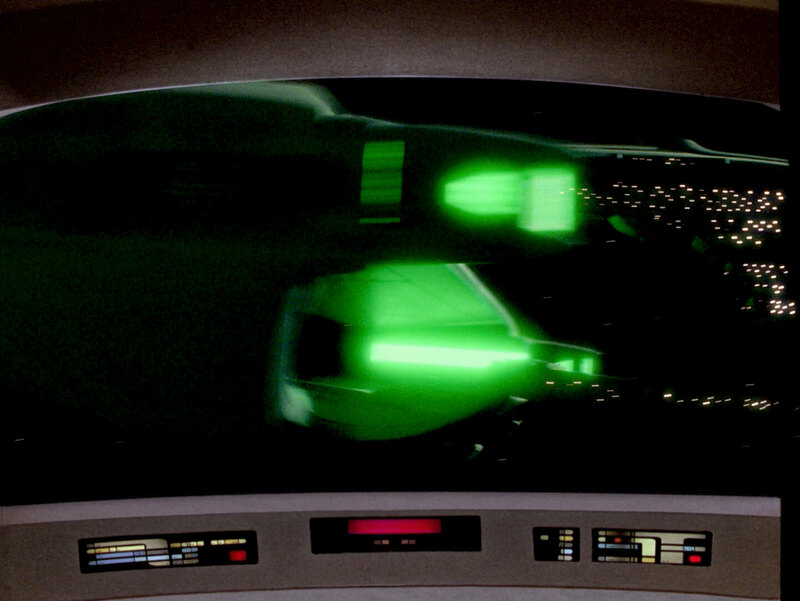 The next shot (H), showing the ship fly away to the right, is stock footage from "The Defector". 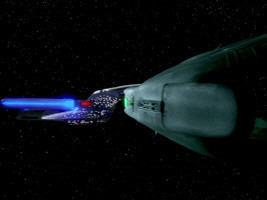 In that episode, the ship engages its cloaking device halfway into the turn, however, so the rest of the footage is not seen clearly (or at all) in the earlier episode. The final shot of the ship seen in the episode (I), newly created for "Tin Man", shows the ship being whirled away by Gomtuu's energy wave. 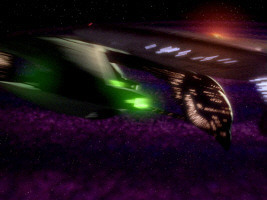 When a Romulan Warbird is next seen in "Future Imperfect", courtesy of an illusion created by Barash, only stock footage from "The Neutral Zone" is used. 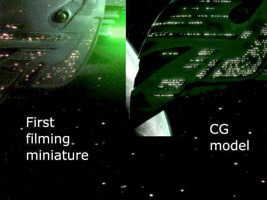 The ship is first seen decloaking and approaching the USS Enterprise-D (A) and then the often re-used footage of the ship as seen on the main viewscreen is featured (B). 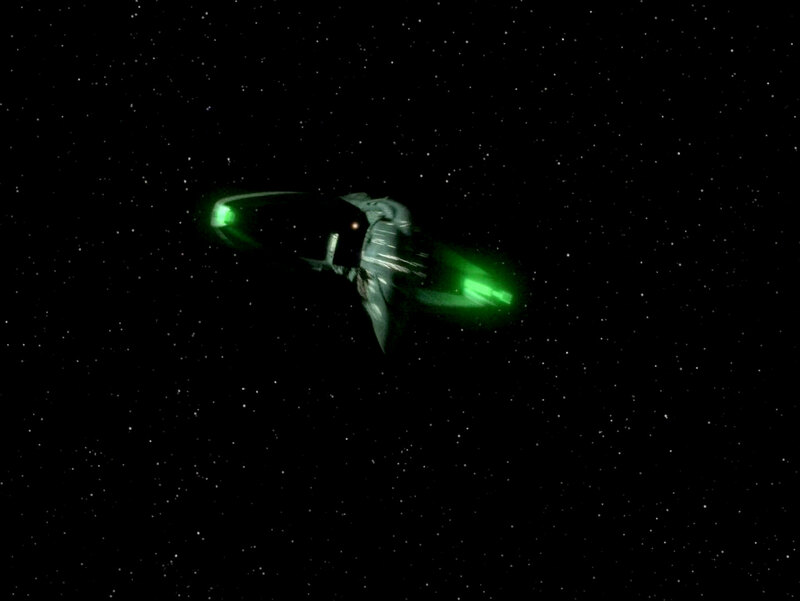 "Future Imperfect" also has the distinction of being the only episode that features a small desktop model of a Romulan Warbird. 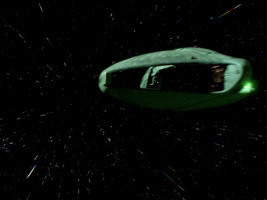 The commercially available AMT/Ertl model kit was used here (C). 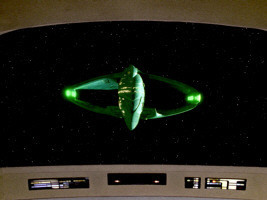 Mike Okuda tells us: " I once assembled a Romulan Warbird model very quickly (assembled and painted in five minutes) in response to a last-minute request from set dressing for something to decorate the desk of a Romulan official in an episode of TNG. 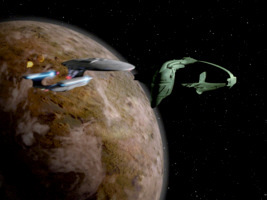 I think the model ended up being used in a couple of episodes." 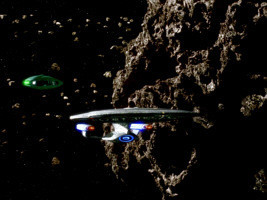 This episode features stock footage of the first filming miniature, created for "The Neutral Zone", and newly filmed footage of the second miniature. 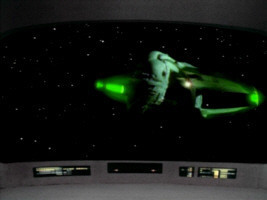 The first shot (A), showing the ship on the main viewscreen of the USS Enterprise-D, was newly filmed for this episode. It seems to lack the intense color of the later shots. 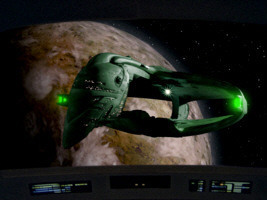 Most likely, when the episode was remastered it was forgotten to recolor the physical model in post production, as was done in all other appearances of the ship in this and other episodes. In this one shot, the ship features the true, unmodified gray color of the second filming miniature. The next shot (B) was newly created for the episode. 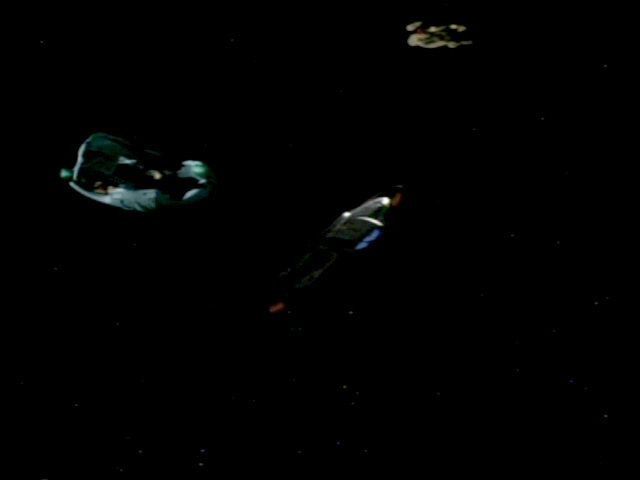 Here, the camera moves slowly down and towards the two ships facing each other. 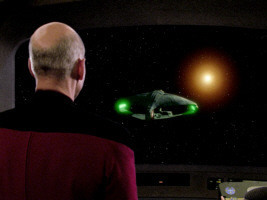 The next shot appears three times in the episode (C). It's the familiar shot of the Warbird on the main viewscreen, re-used from "The Neutral Zone". 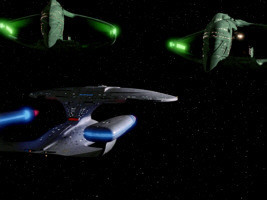 In the next sequence, newly filmed for the episode (D), a second Romulan Warbird is seen decloaking while the USS Enterprise-D is still facing off with the first Warbird. 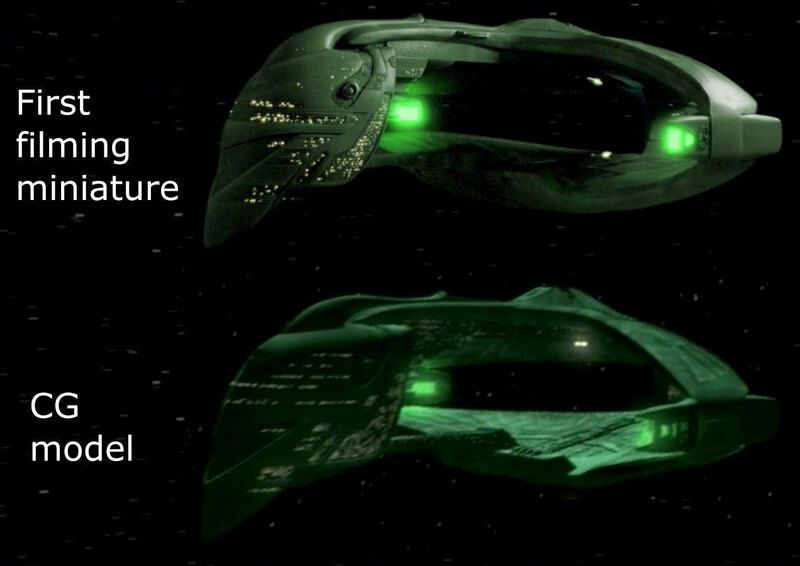 The last new shot (E) gives us a fascinating glimpse at the structures within the two "shells" of the hull. 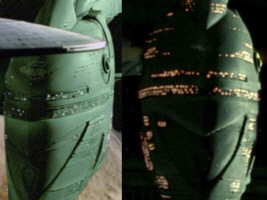 The additional details on the side of the nacelle are clearly seen in these screenshots (Comparison of the physical models, 3). 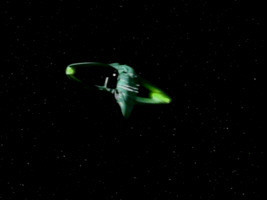 All footage of the Romulan Warbird seen in "The Mind's Eye" was newly created for this episode using the second filming miniature. 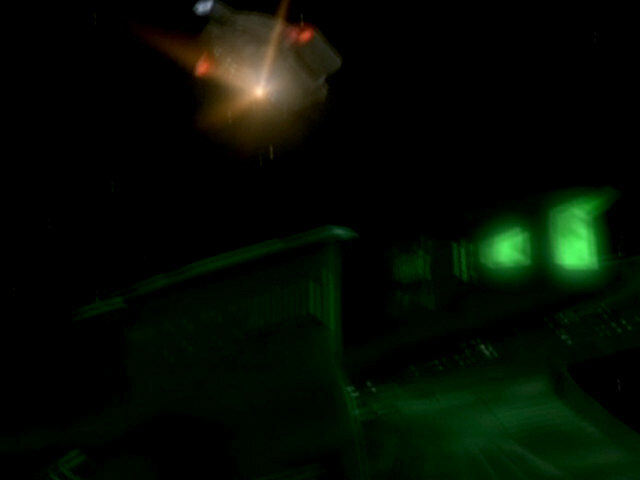 The first shot features the Warbird slowly flying towards the camera (A). 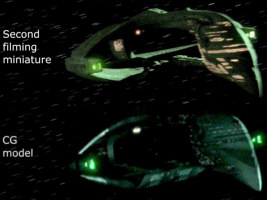 The second shot shows the almost motionless Warbird. 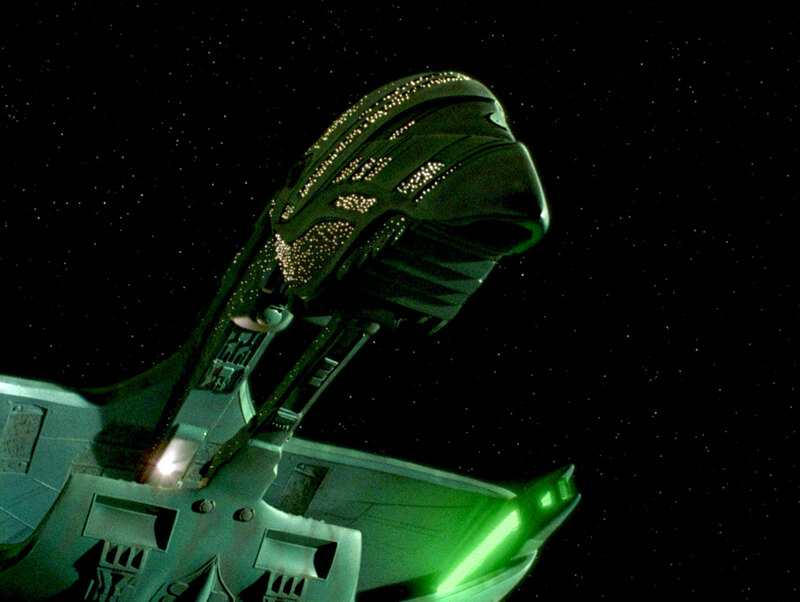 The third spectacular shot (B) features a unique, never before seen angle of the ship. 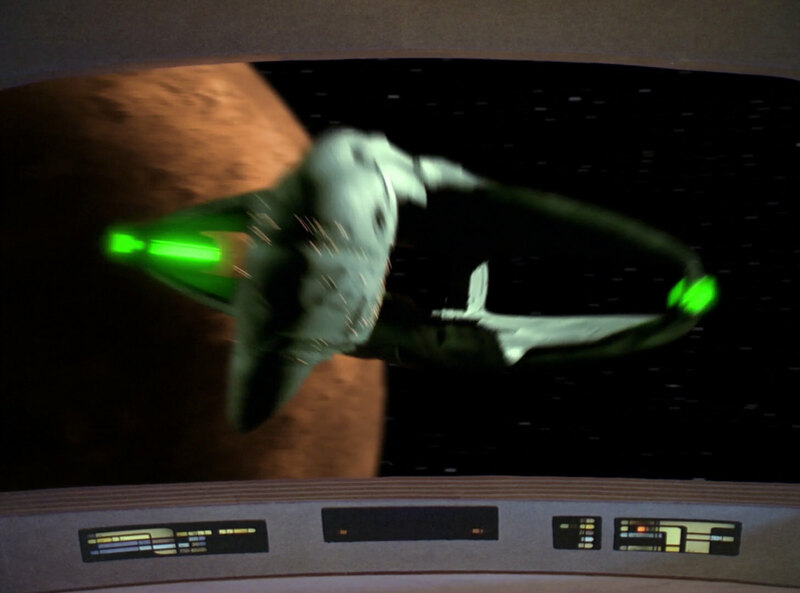 All footage of the Romulan Warbird that appears in this episode has been seen before in earlier episodes. 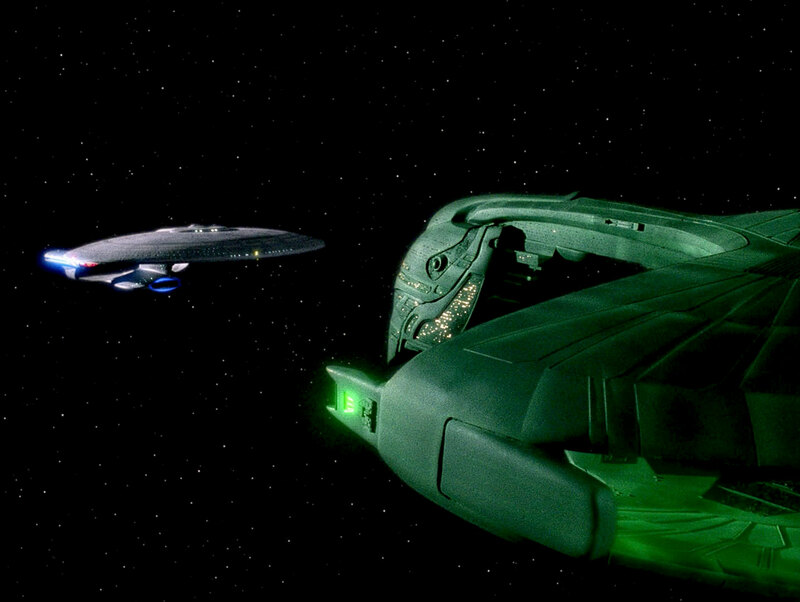 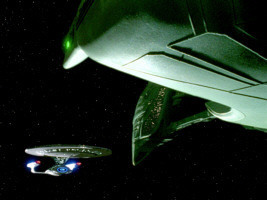 The first shot (A) of the Enterprise-D facing the ship was created for "The Defector". Like in "Tin Man", only the right Romulan ship was used in this episode, however. 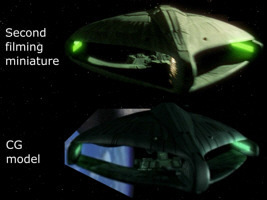 The two shots of the Warbird as seen on the main viewscreen were created for "The Mind's Eye" (B). 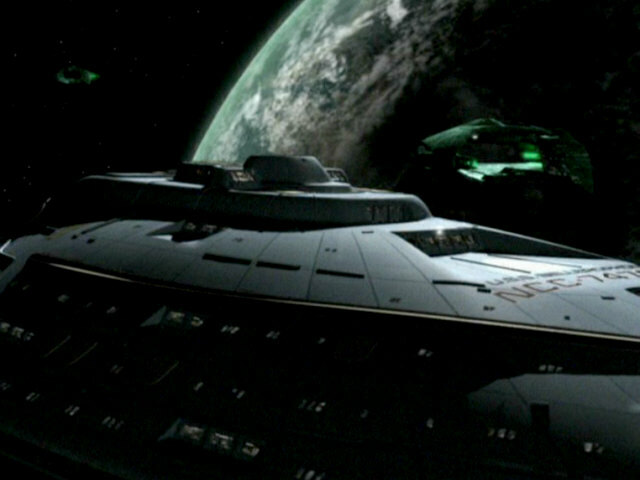 In the second shot, the bow of the ship is nicely seen up close. The comparison screenshot of the original filming miniature shows the much more subdued lights in the windows, especially at the top of the curvy front section (Comparison of the physical models, 4). 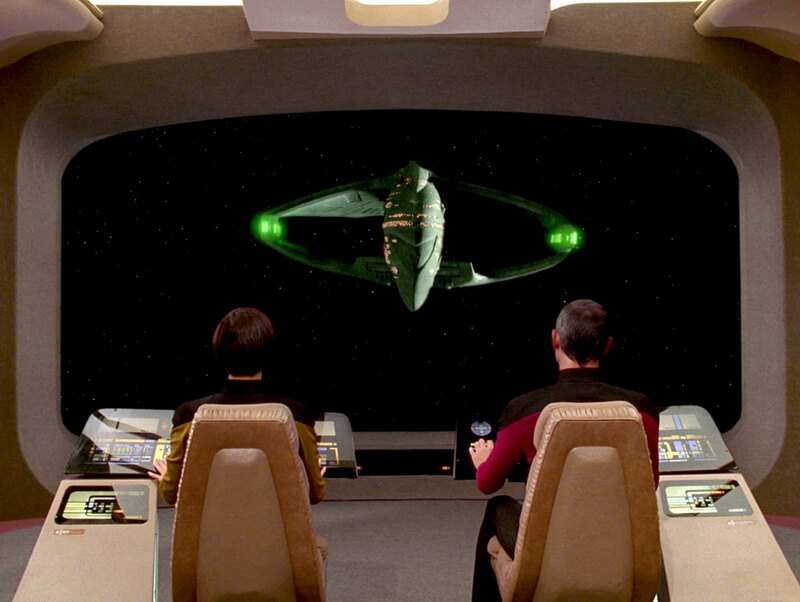 The next shot (C) was originally created for "Data's Day". 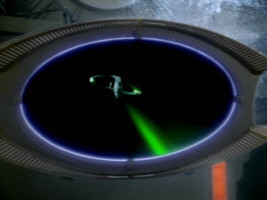 The shot that follows after that (D) is the only footage of the original filming miniature, filmed for "Contagion". 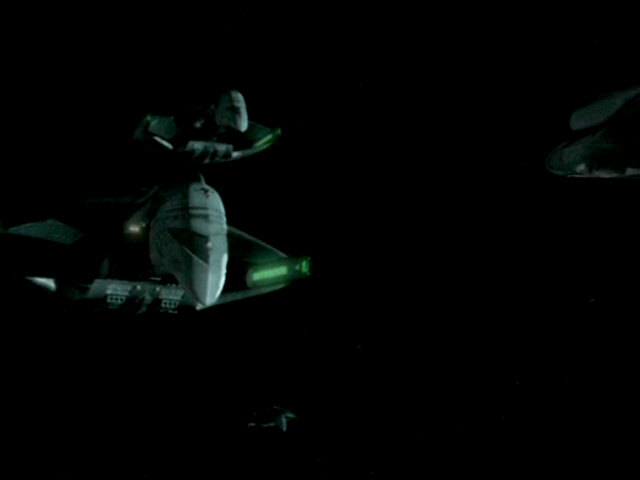 The last proper shot (E) of the Warbird seen in the episode (there's only one more shot showing only the silhouettes of three Warbirds as they are detected by the USS Sutherland), was created for last season's "The Mind's Eye". 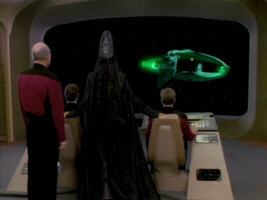 Here, the footage appears without the Romulan tractor beam or the shuttlepod. 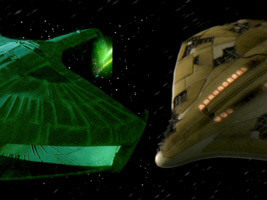 The episode features two new, very similar shots of a Romulan Warbird. The first one shows the Warbird decloaking (A) and the second one shows it destroying the three Vulcan ships (B). 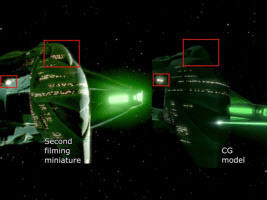 In order to illustrate the difference between the two filming miniatures of the ship, a screenshot from sequence A was flipped and but next to a screenshot of the original filming miniature (Comparison of the physical models, 5). 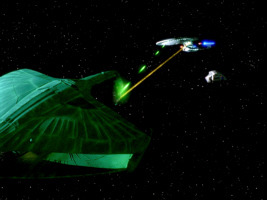 Several new shots of the second filming miniature were filmed for this episode. The first shot (A) shows the Warbird slowly approaching the camera and is similar to all the different flybys of the USS Enterprise-D filmed for the series. In the second shot (B) the ship similarly flies away from the camera. 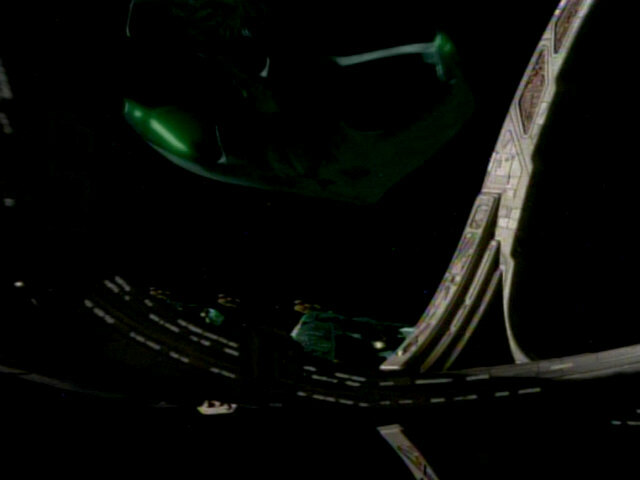 The same footage is flipped horizontally and re-used a little later in the episode (C). 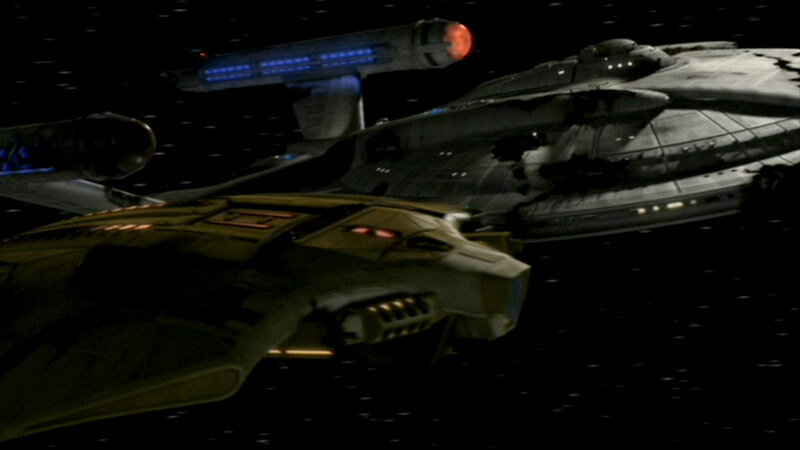 The front section of the Warbird is nicely seen in the next shot, newly recorded for this episode (D). The additional details on the side of the nacelle can again clearly be seen here. The next two shots are cases of stock footage of the Warbird used in the episode. The first shot (E) was originally filmed for "The Mind's Eye". Here, it appears again without the tractor beam and the shuttlepod, as was already the case in "Redemption II". The camera is much closer to the Warbird, however. The second re-used shot (F) is the only appearance of the original filming miniature in this episode. 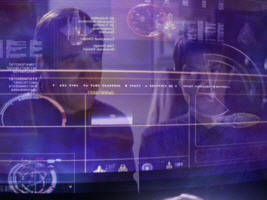 The footage was filmed for "Contagion" but "Face of the Enemy" is the only episode in which the footage is re-used flipped horizontally. 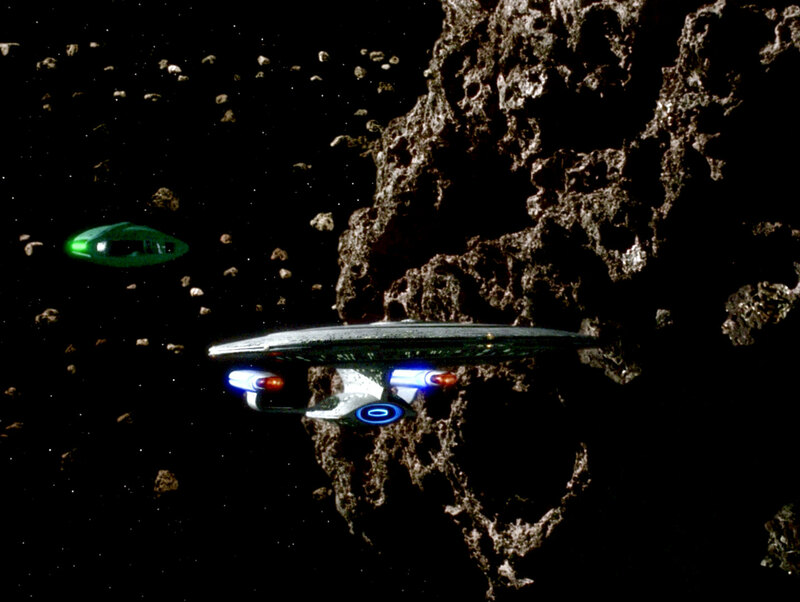 This marks the last appearance of stock footage of the original filming miniature ever on any Star Trek episode. 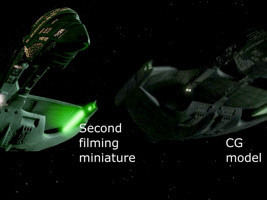 From now on, only stock footage or newly filmed material of the second filming miniature will be used. 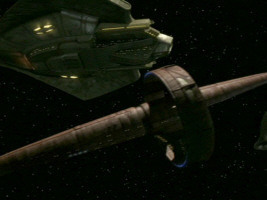 In shot (G), an underside shot of the Warbird, was originally created for this episode. The next shot (H) is again a re-use, this time from "The Mind's Eye". The final two shots were again newly created for the episode. 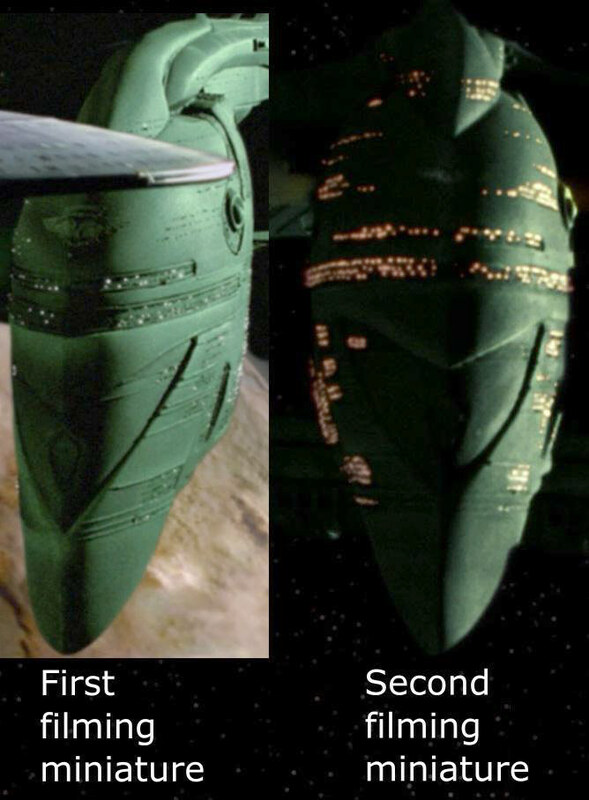 The first shows the front of the ship (I), the second is a nice shot of the complete model (J). A comparison screenshot of the original filming miniature again nicely illustrates the difference in window lighting between the two models (Comparison of the physical models, 6). 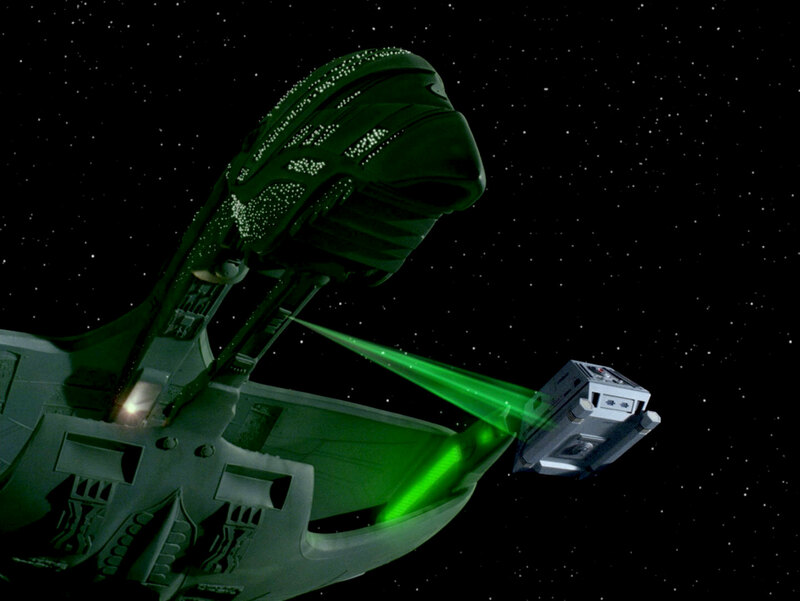 This episode only features one shot of a Romulan Warbird. 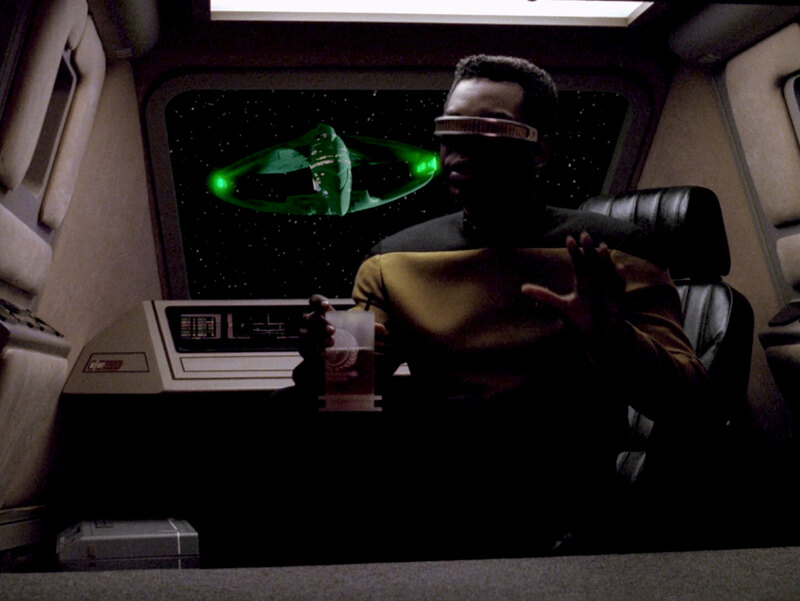 The footage was originally filmed for "Data's Day". 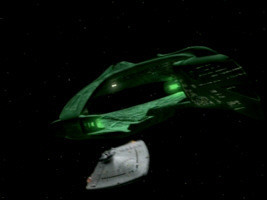 Warbird in TNG: "Birthright II"
For this episode, three new shots of the Romulan Warbird were filmed. One is a nice aft view that shows the dorsal side of the ship (A). 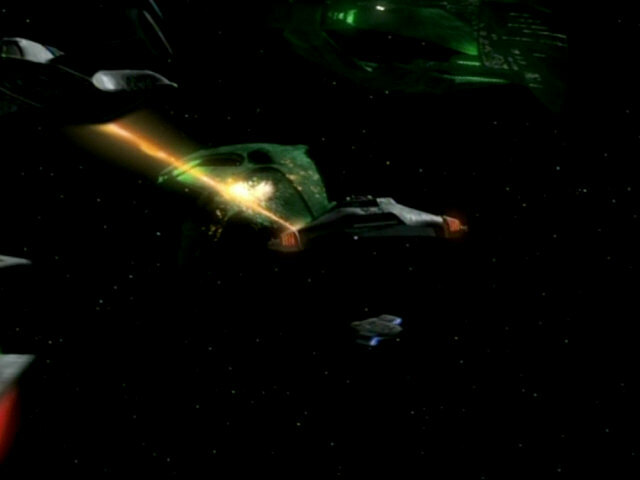 The second shot shows the Warbird, frozen in time, from a distance (B). In the final shot, the camera is located behind the left side of the ship, filming through the open space between the two "shells" comprising the mains section of the ship (C). 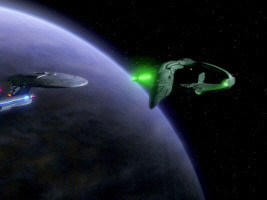 A similar shot, though angled slightly differently, was used in "Data's Day". 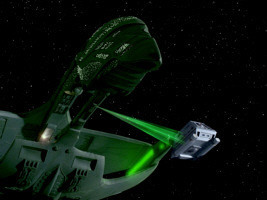 The Romulan D'deridex class Warbird makes its last appearance on TNG in this episode. Most of the footage used was created for earlier episodes, only a few shots that show the ship from a distance were newly created for the episode. 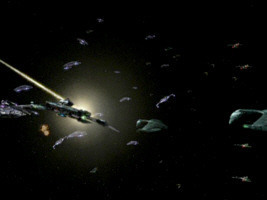 The first shot, showing the decloaking Warbird, was created for season 6's "Face of the Enemy" (A). 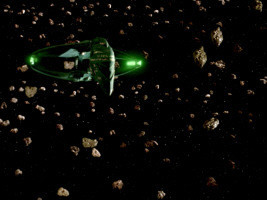 The second shot of the ship, seen within the Devolin asteroid field, was created for "The Mind's Eye" (B). In that episode, the ship wasn't seen on the main viewscreen but was visible through the cockpit window of Geordi's shuttlepod. The shot had already been re-used in "Redemption II" and "Face of the Enemy" where it was also seen on the main viewscreen of the USS Enterprise-D. 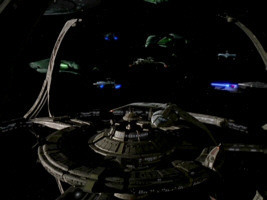 The next two shots (C+D) were newly filmed for the season 7 episode and show the ship from a distance. 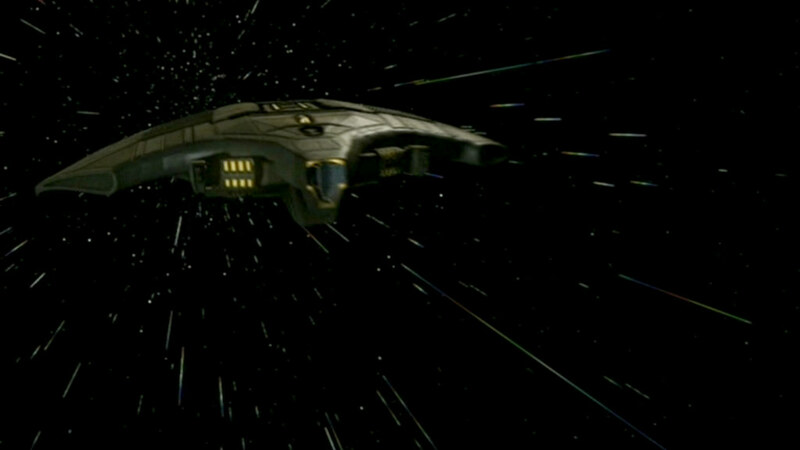 In the first shot, the ship is seen flying away from the camera. In the second shot, the ship is facing the USS Enterprise and is then slowly flying away to the left. 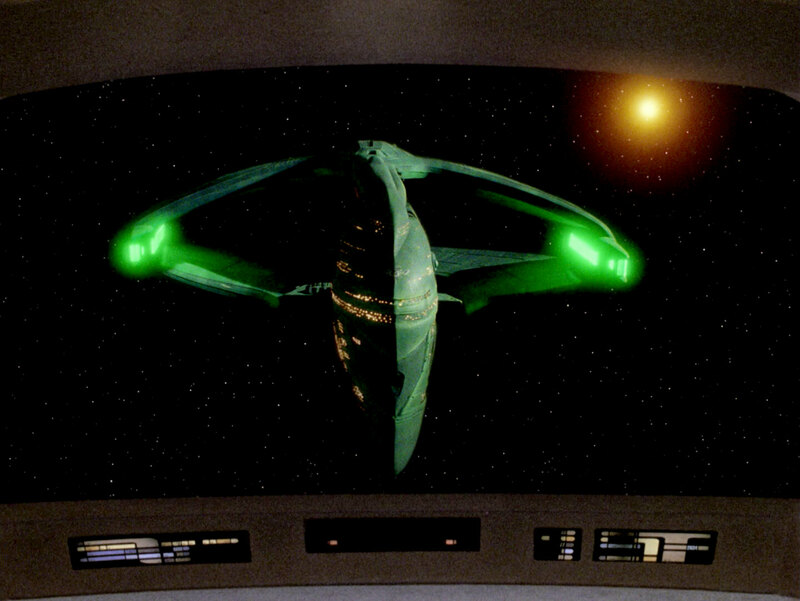 The final shot of the Romulan Warbird on TNG (E) is a re-use of footage filmed for "Face of the Enemy" (shot J in that episode). 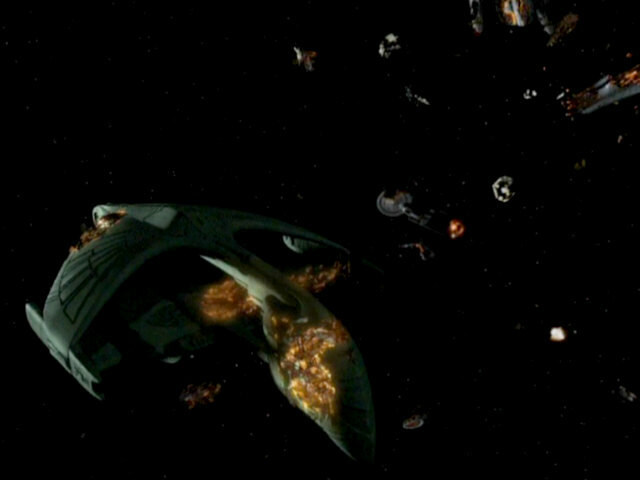 For this sequence, the footage was flipped horizontally, however. The Romulan Warbird next appeared in the DS9 episode "Visionary", where footage of the ship only appears on the main viewscreen in DS9's ops. 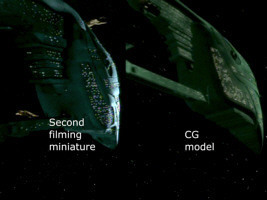 No new material was filmed using the miniature as stock footage from "The Defector" was used. 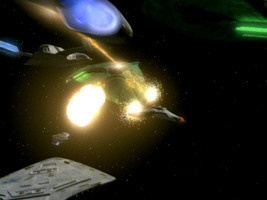 In both episodes, the Warbird is seen flying quickly past the camera, firing its disruptors. 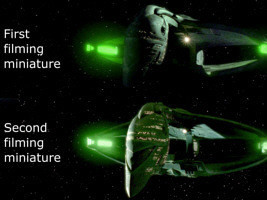 As can be seen, the firing effect (and the angle of the disruptor beams) is different and the large light inside the "shell" of the main hull of the ship is not lit in the DS9 episode. 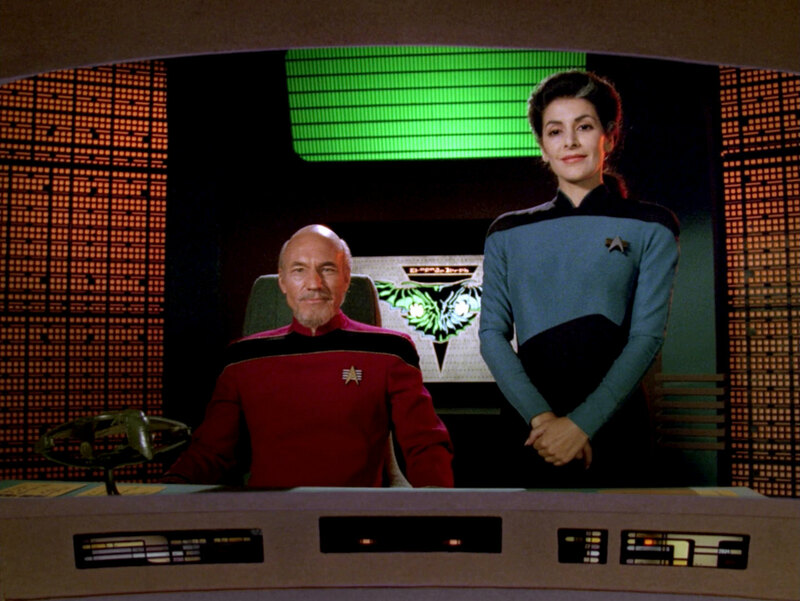 To further illustrate the similarities between the original footage and the re-used shot, SD screenshots of the original TNG episodes are provided for this and the following re-use of stock footage. Warbird in TNG: "The Defector"
Stock footage was again employed in the ship's first appearance on Star Trek: Voyager. 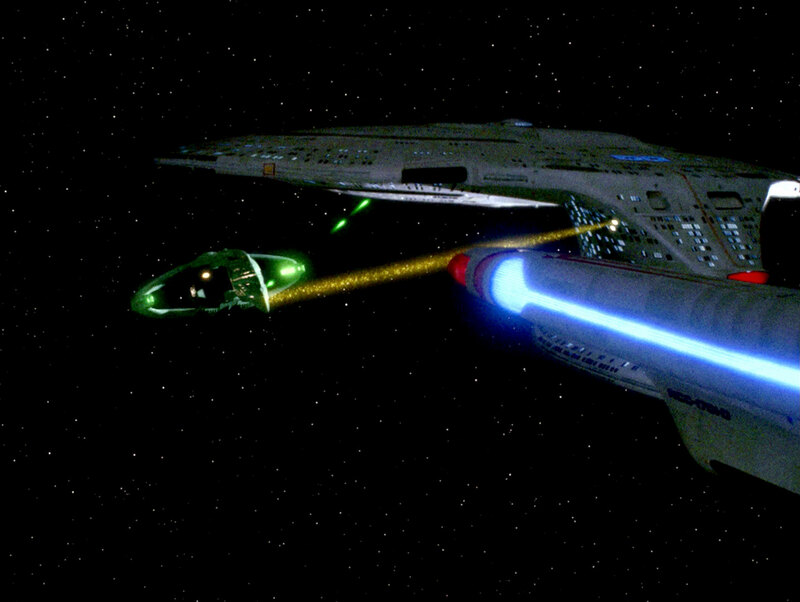 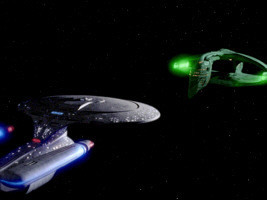 The ship appears on the main viewscreen of the USS Voyager (actually a holographic representation of the same) and is seen firing its disruptors. 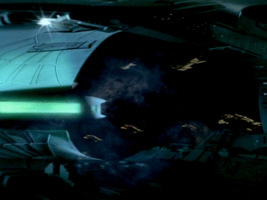 The shot, with a completely motionless ship, is a freeze frame of footage filmed for "Data's Day". 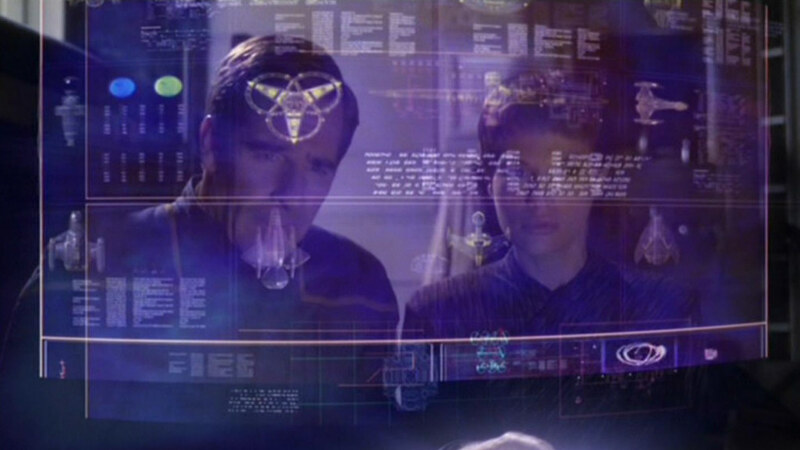 For this re-use, the footage was flipped horizontally. 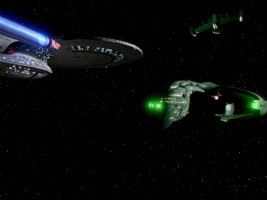 Warbird in TNG: "Data's Day"
Warbird in VOY: "Learning Curve"
The Romulan Warbird appears in one shot which was newly filmed for the episode. 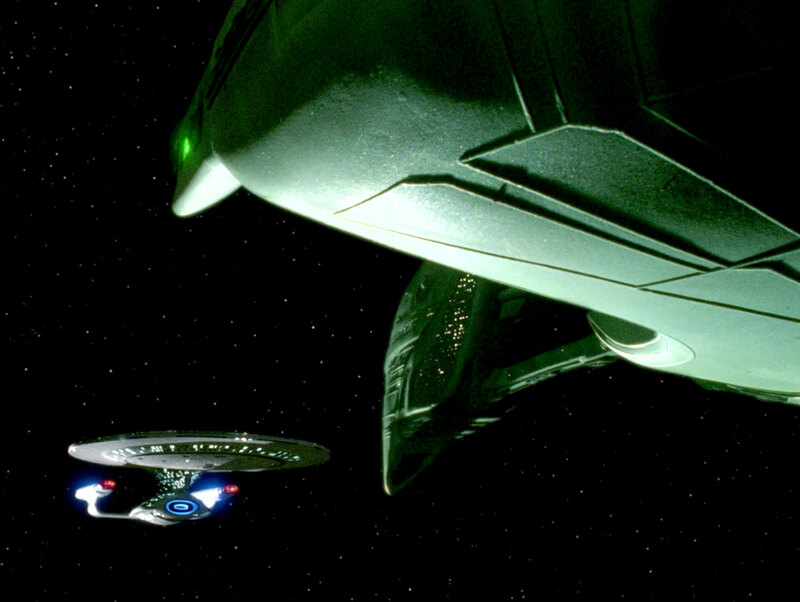 This shot shows the underside of the ship. 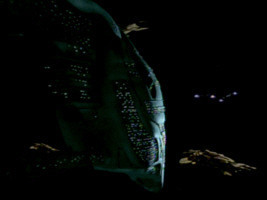 The shot is similar to a shot created for "The Mind's Eye". 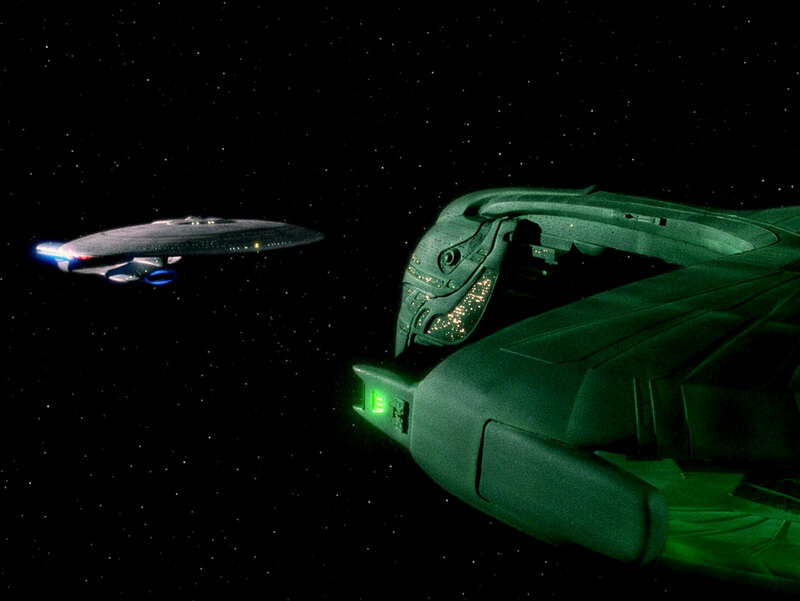 In that shot, the ship is angled to the right, here it's angled to the left. 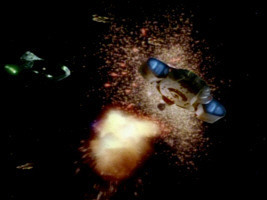 Warbird in DS9: "Improbable Cause"
The second filming miniature was extensively used for the last time in this episode. 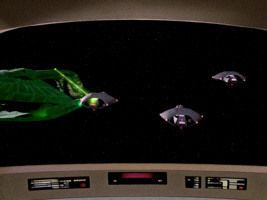 In the first shot featuring Warbirds (A), four ships are seen on the screen at the same time. 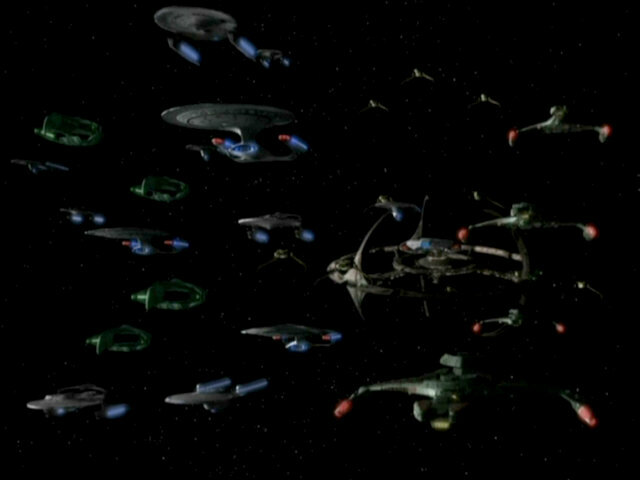 This is the largest number of Romulan Warbirds ever seen in one spot. 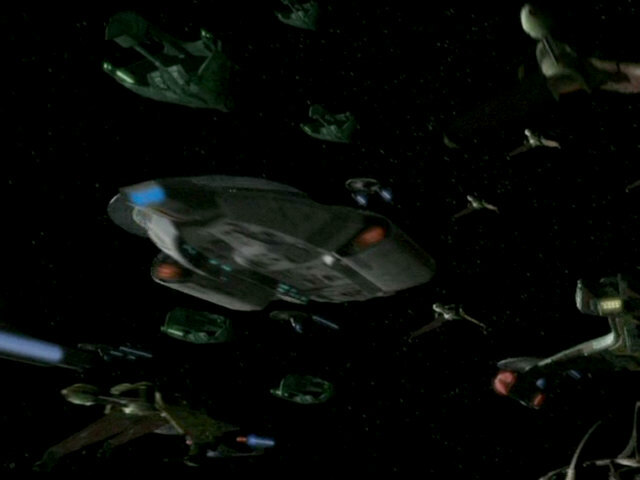 In the second shot featuring a Warbird (B), one single ship is seen approaching the Bajoran wormhole. 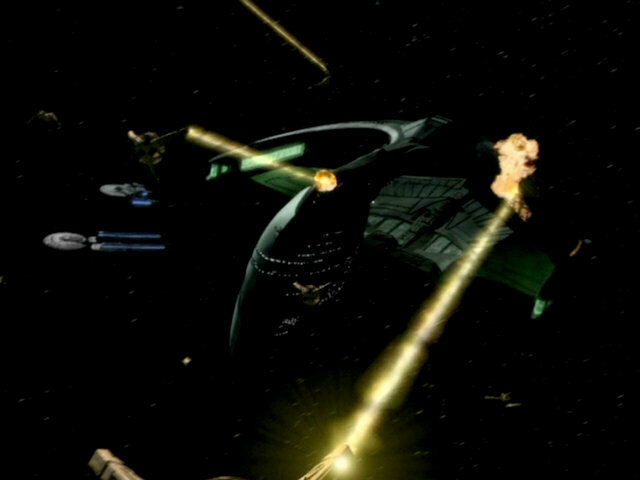 The third shot shows three Romulan Warbirds, all from a similar angle, firing at the Founder homeworld (C). In the fourth shot (D), the beginning of the battle sequence, a Jem'Hadar fighter is flying towards two Warbirds. The fifth shot (E) shows one single Warbird as it is attacked by Jem'Hadar ships. 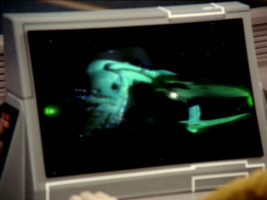 Similar to shots seen in "Data's Day" a "Timescape", the camera is filming through the hollow midsection of the ship. 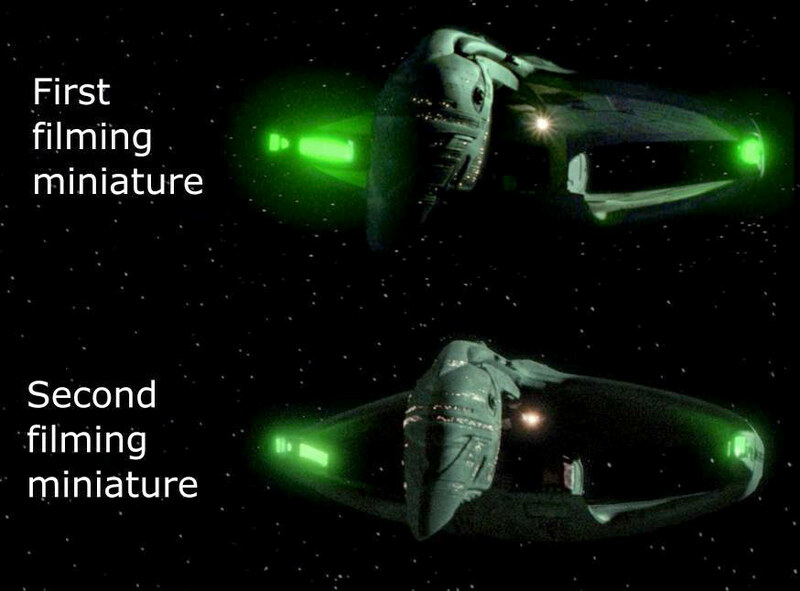 This affords a good look at the inward side of the warp nacelles. The next shot (F) shows a burning Warbird, as Odo and Garak's runabout quickly leaves the ship behind. 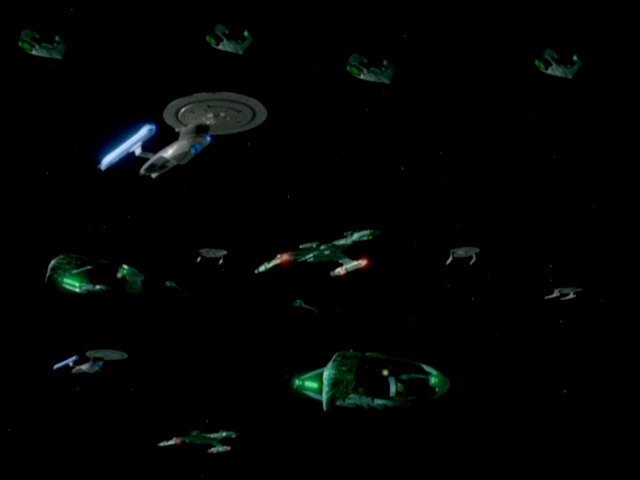 After this shot, a single Warbird appears in two more scenes featuring the USS Defiant in the middle of the battle (G+H). 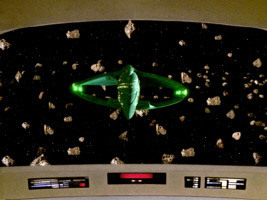 The footage of Romulan Warbirds seen in this episode mostly consists of stock footage from "The Die is Cast". 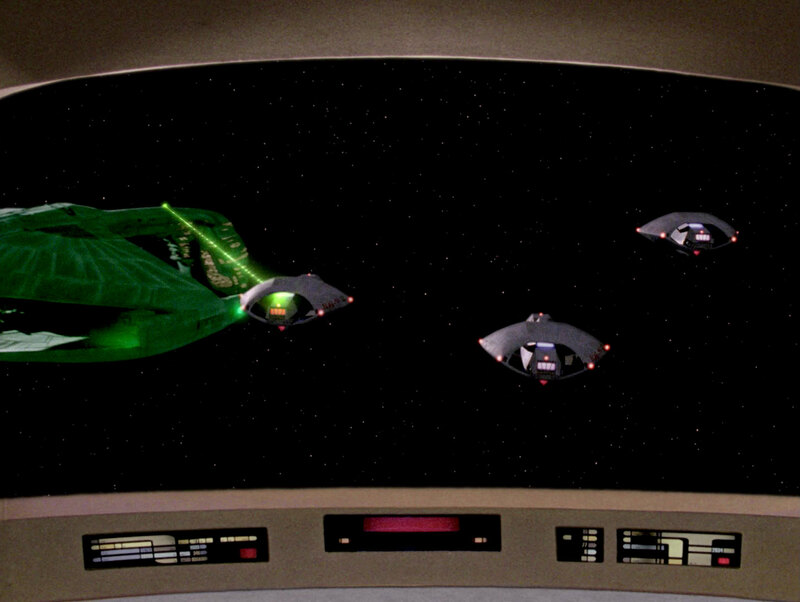 The shot of the Warbirds decloaking while passing by DS9 was created for that episode. 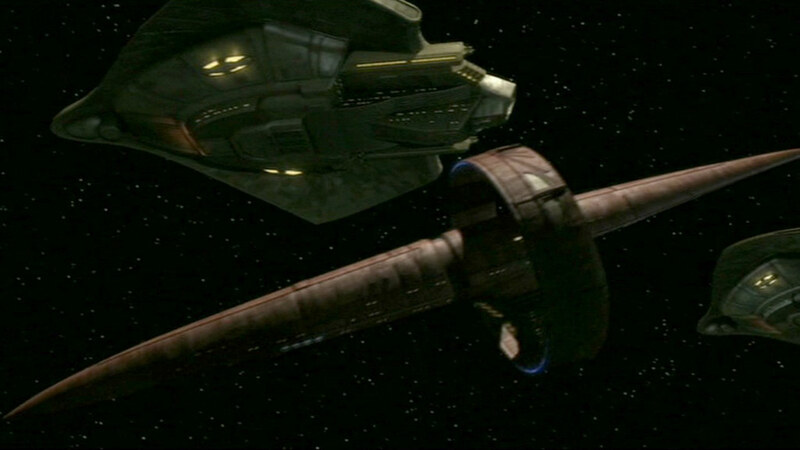 The different elements were edited together differently, however, as the first decloaking Warbird in that episode does not appear and the three following Warbirds decloak a little later in the shot. 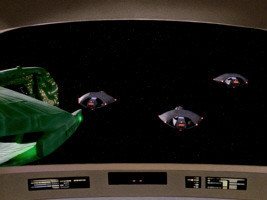 The footage of the four Warbirds at the top of the frame in the background did not appear in "The Die is Cast" and must have been newly created for this episode. 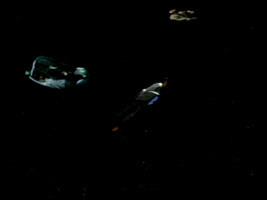 As can be seen, the 1st and 3rd Warbird from the left use the same footage, as do the 2nd and 4th Warbird. 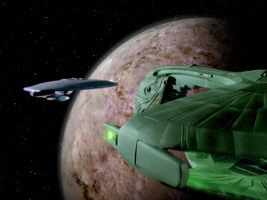 As the next and final episode in which the physical model of the Warbird is seen on DS9, "Tears of the Prophets", only features stock footage of the model, this episode is the last episode in which new footage of the physical model appears. Warbird in DS9: "By Inferno's Light"
A CG model of the Romulan Warbird was finally created for this episode. 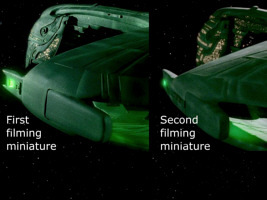 The model was based on the second filming miniature as it does feature the added details on the side of the nacelles only found on that miniature (visible in screenshots 2, 5 and 6). 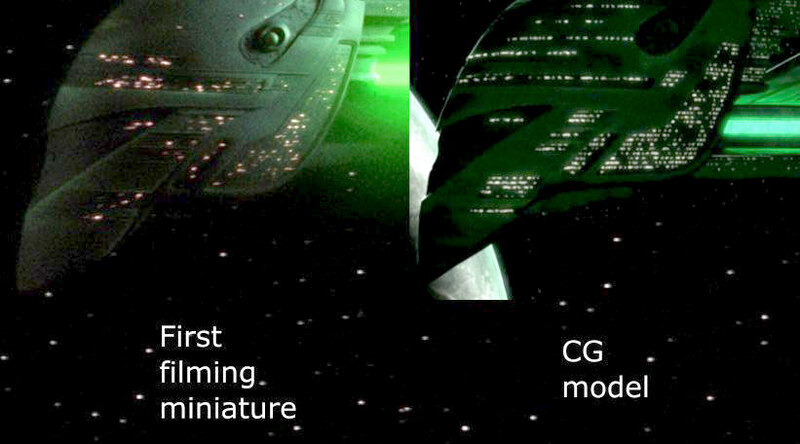 Apart from the number and placement of lit windows, at least two major differences can be seen between the second physical model and the new CG model. The section at the very top front of the Warbird's head does not feature any windows at all on the CG model and the bright light on the underside of the upper main hull "shell" consists of two light sources on the CG model (Differences between the physical model and the CG model). 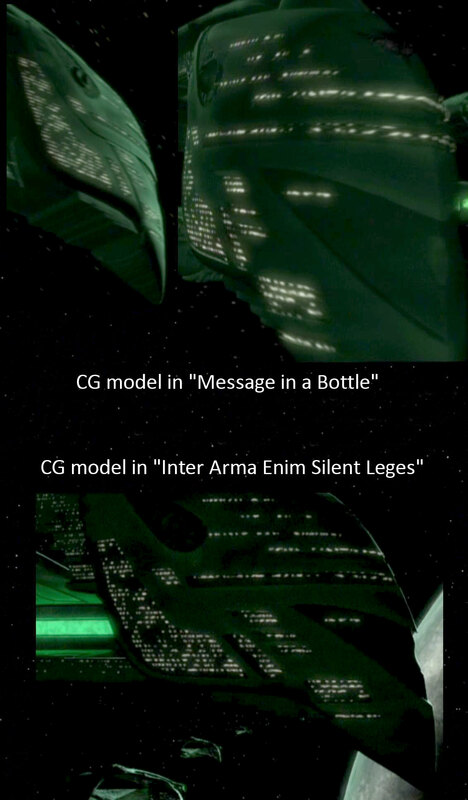 A few more screenshots from the episode document the appearance of the CG model. Likewise, whenever the CG model is dealt with from now on, not every single shot featuring a Warbird will be analyzed but a selection of screenshots will be featured. 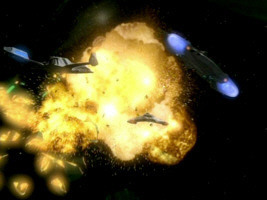 Towards the end of this episode, the hull of one Warbird is seen burning and disintegrating until the Warbird explodes (7). 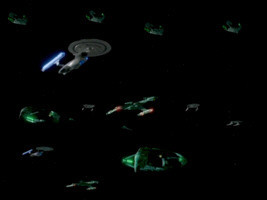 Similar effects would later be seen in some DS9 episodes during battle scenes. The first shot of Romulan Warbirds seen in the episode uses footage filmed for "The Die is Cast". Again, several Warbirds are seen decloaking close to DS9 (A). Like in "By Inferno's Light", where the footage was also re-used, the exact moments when the Warbirds decloak are different, even though the relations of the ships to the station are similar in each of the three episodes. As the shot ends earlier than in the previous two episodes, the fourth Warbird is not seen decloaking. 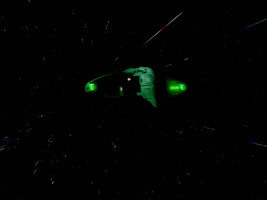 In contrast to "By Inferno's Light", the first Warbird (seen at the top of the screenshots) is back again. 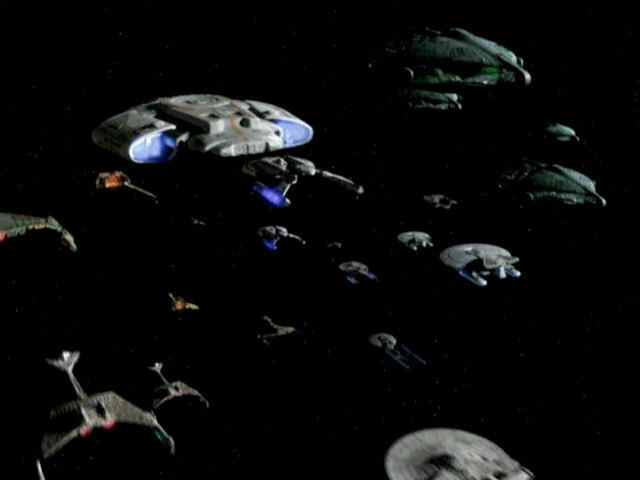 The four small Warbirds in the background are a little different. 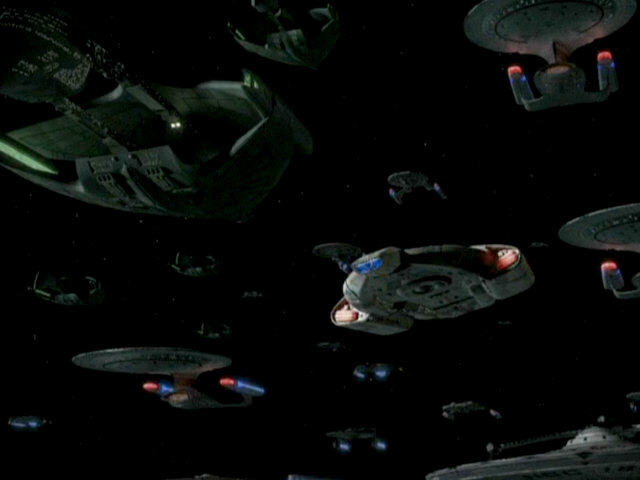 The two Warbirds on the left were not changed but the two Warbirds on the right are seen from a slightly different angle. It is unlikely that new footage of the physical models was filmed for this relatively minor scene. 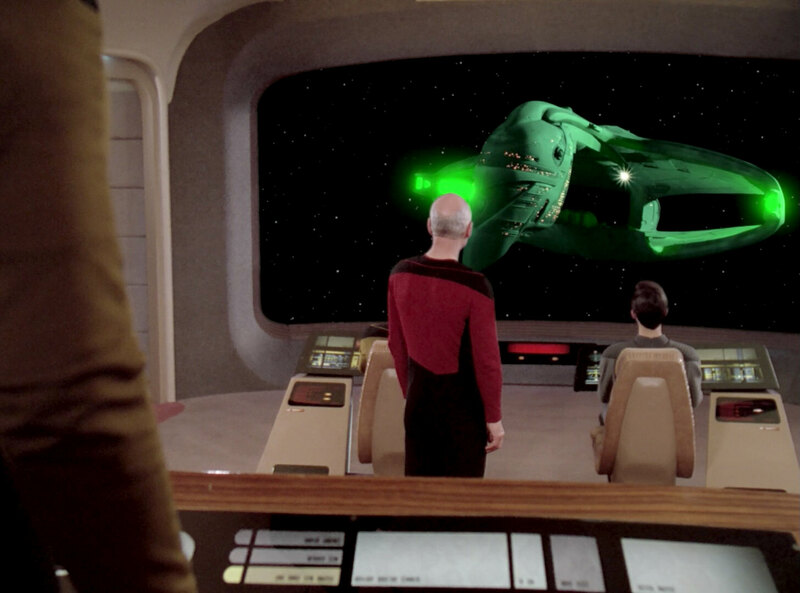 It is more likely that this footage already existed for earlier episodes. 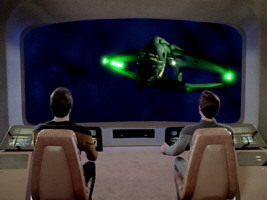 This is the last scene that features footage of the physical model. 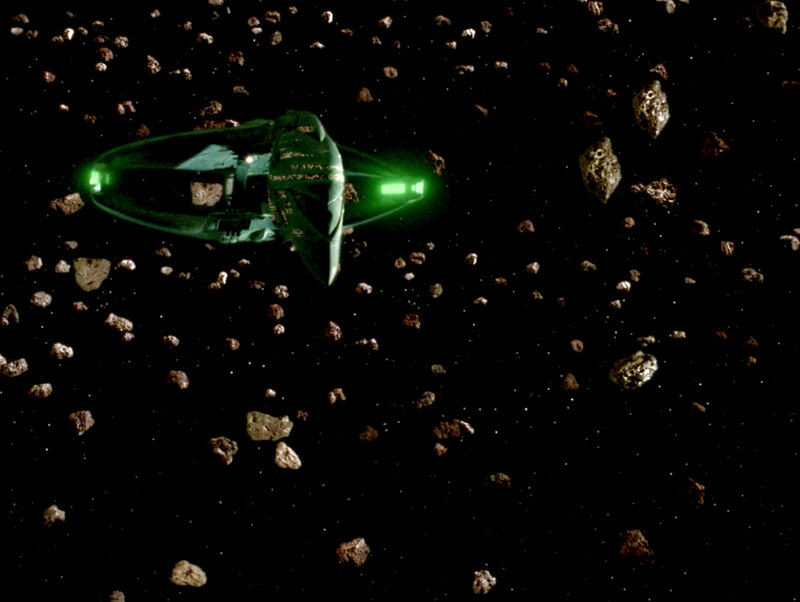 In all following shots in this episode and DS9 episodes in general, only the CG model, created for "Message in a Bottle" appears. The CG model appears in several scenes in the episode, in the proximity of DS9 and during battle scenes. 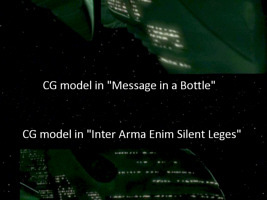 In these shots, the lack of windows in the upper front section of the model, addressed above when discussing the CG model in "Message in a Bottle", can be seen as well. 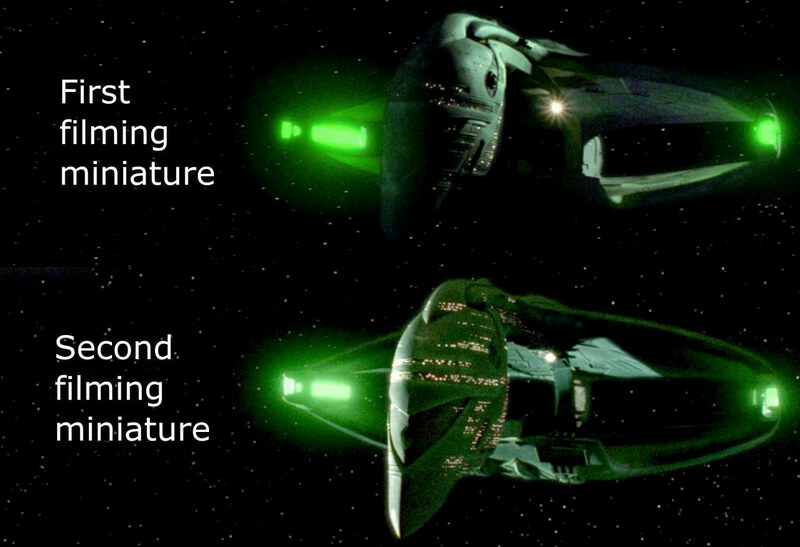 This is one feature that makes it possible to quickly differentiate the CG model from the second physical model. 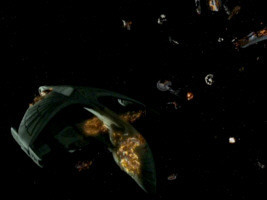 Like in "Message in a Bottle", Warbirds with burning and disintegrating hull pieces can be seen towards the end of the episode (last three shots of sequence B). 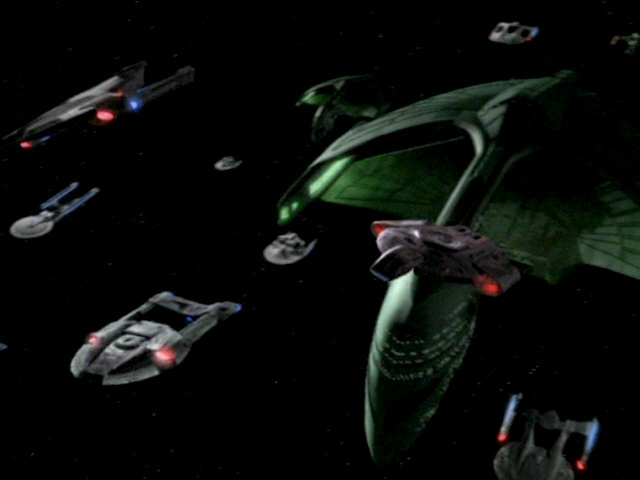 Three Romulan Warbirds are seen close to DS9 in "Image in the Sand". 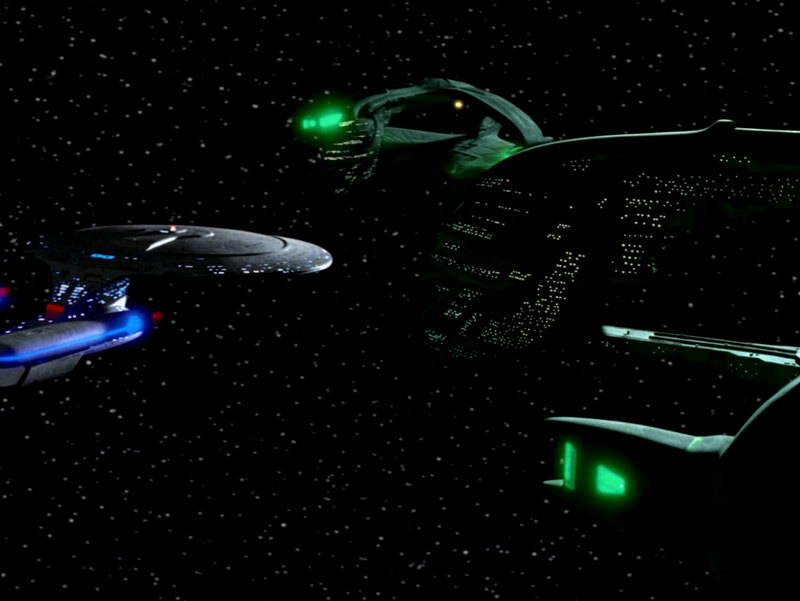 The CG model was used here. Warbird in DS9: "Image in the Sand"
A large fleet of Romulan Warbirds is seen in this episode. Like in "Message in a Bottle", it can clearly be seen that window lights are missing at the top front section of the Warbird's "head" and that there are two lights on the underside of the upper main hull "shell". 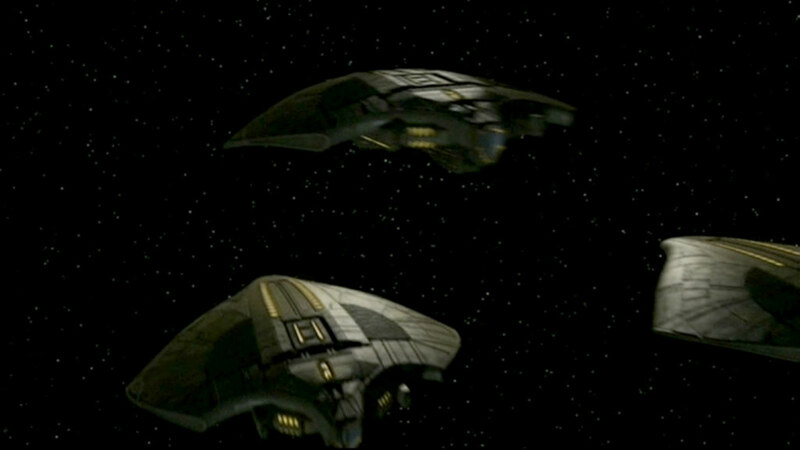 A series of screenshots illustrates the appearance of the CG model in this episode. 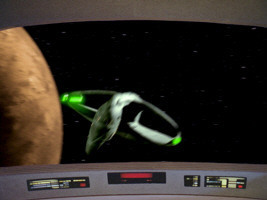 Warbird in DS9: "Shadows and Symbols"
Several Warbirds are seen up close in orbit of Romulus in two establishing shots in this episode. 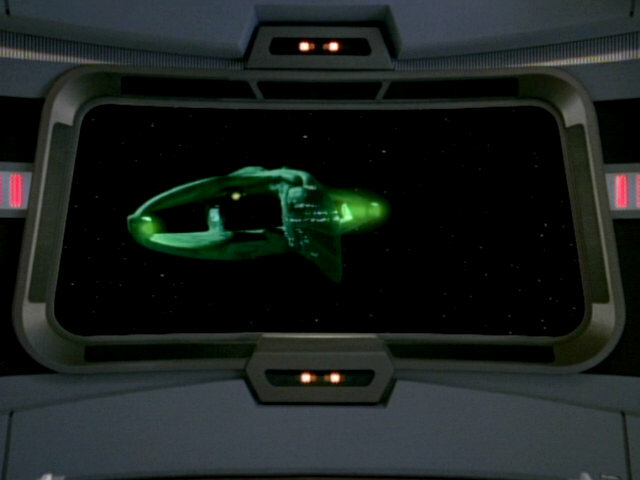 The comparison of the close-ups from this episode and from VOY: "Message in a Bottle" shows that there is only one CG model (Window comparison of two shots of the CG model). 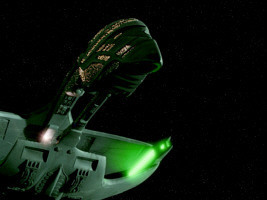 Warbird in DS9: "Inter Arma Enim Silent Leges"
The episode features several new shots of the CG model of the Romulan Warbird. 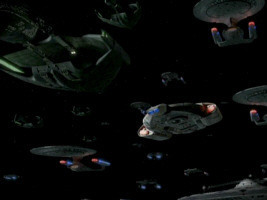 In several of these scenes, it can clearly be seen that the ship is missing the previously mentioned windows at the front of the ship. Later in the episode, another burning Warbird with disintegrating hull sections is seen. Warbird in DS9: "The Changing Face of Evil"
Romulan Warbirds are seen for the last time in the final DS9 episode. 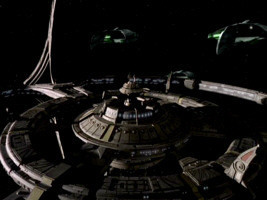 Two shots that appear in the episode are stock footage from earlier DS9 episodes. 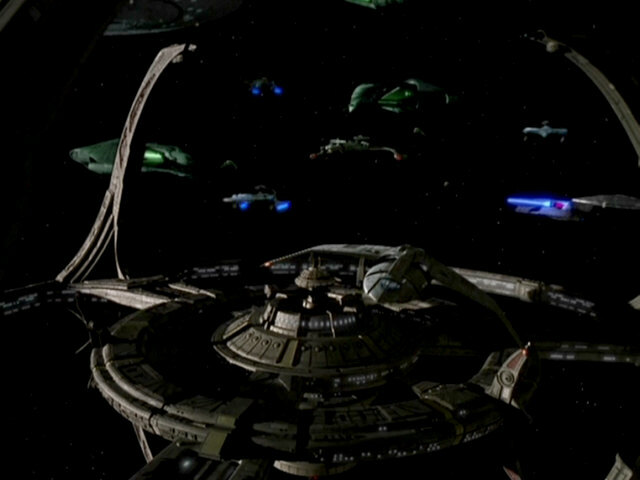 The shot of the fleet leaving DS9 (1) was first used in "Tears of the Prophets". 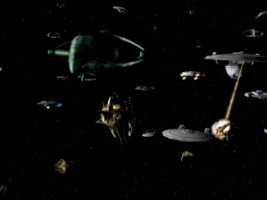 The second shot, featuring Warbirds, that appears in the episode (2) was originally created for "The Changing Face of Evil" (screenshot 1 from that episode). 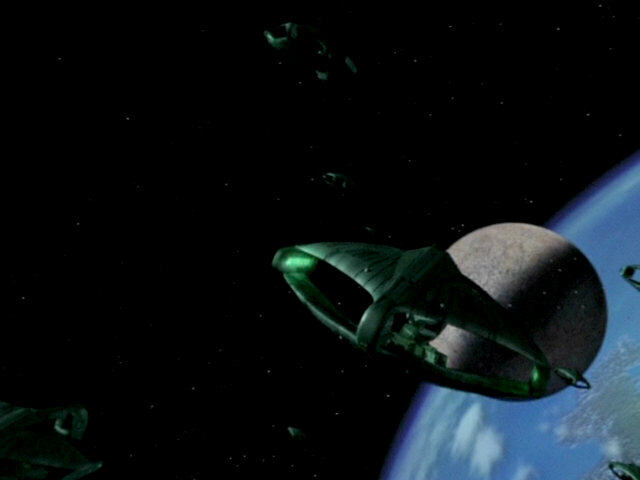 In that episode, the scene ends a little earlier, however. 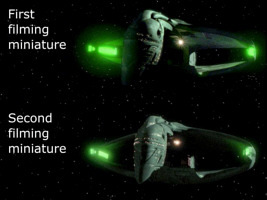 In one of the scenes (3), the added details on the side of the nacelles (first introduced when the second physical filming miniature was created) and the two internal light sources (a feature of the CG model only) can be seen. After this final appearance on DS9, the unmodified CG model of the Romulan D'deridex class Warbird was never seen again on any Star Trek episode. 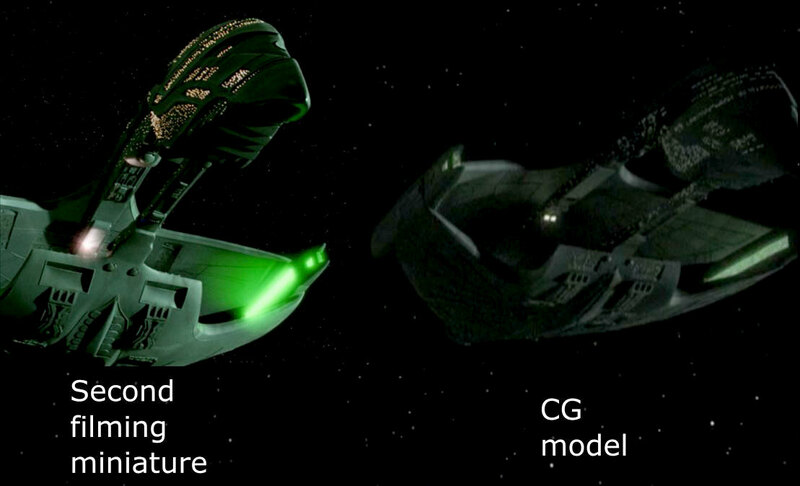 In the next few images, the differences and similarities between the CG model and the two physical models are illustrated (Comparison of physical models and CGI model, 1-7). Some years later, the CG model of the Romulan Warbird was used as the basis for the Mazarite warship which appeared in this episode. The upper half of the main hull "shell" was cut off and heavily modified (adding new details on the front and bottom of the ship). 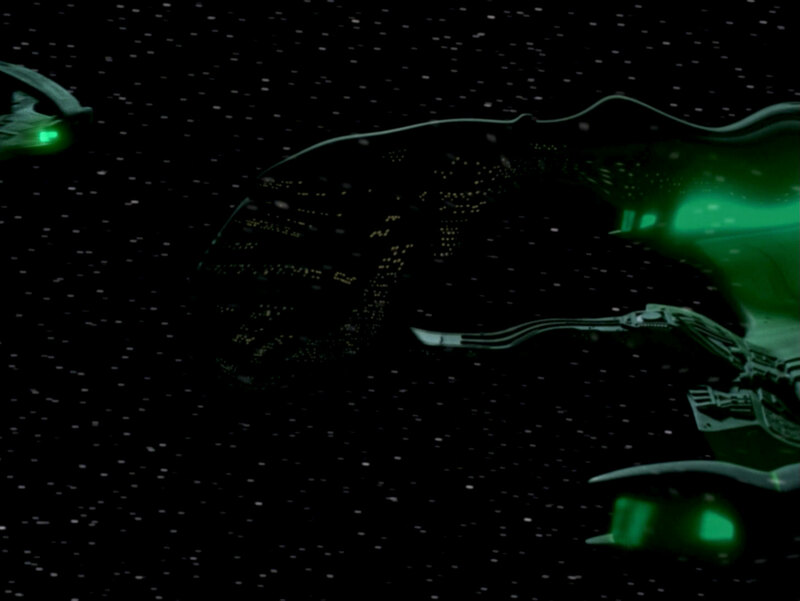 The two rows of semicircles on the dorsal side of the model now featured yellow lights. Three nearby stripes, already present on the Romulan Warbird, also feature yellow lights now. 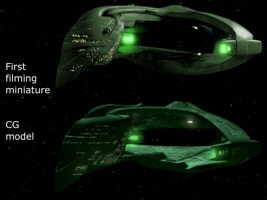 Mazarite warship in ENT: "Fallen Hero"
Illyrian ship in ENT: "Damage"
Apart from the episodes in which the interior of a Romulan Warbird is seen (on the bridges in "Face of the Enemy" and "The Die is Cast"), schematics or graphics of a Romulan Warbird appear in two episodes. 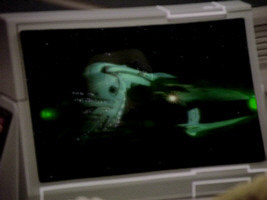 In "Drone", the aft section of a Warbird is briefly seen as a graphic on a monitor in main engineering aboard the USS Voyager. 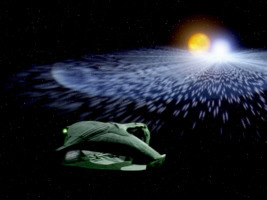 This graphic was originally created for the Star Trek Encyclopedia. 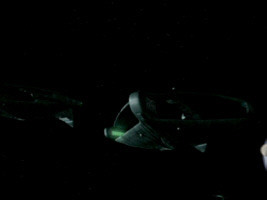 In "Future tense", a top and aft view of a Romulan Warbird is seen in Daniels's temporal database. Warbird graphic in VOY: "Drone"
Warbird graphic in ENT: "Future Tense"
While the AMT/Ertl model of a Romulan Warbird is only seen in one episode, "Future Imperfect", the nacelles of the model kit were used as two types of scanners. 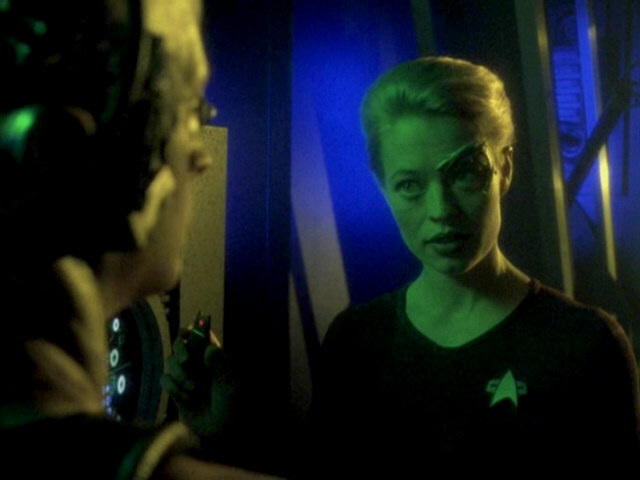 In "Visionary", Bashir uses a nacelle-scanner, as does Seven of Nine in "Collective". 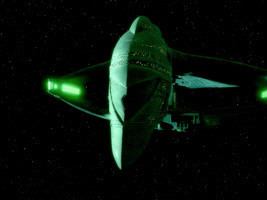 Warbird nacelle in DS9: "Visionary"
Warbird nacelle in VOY: "Collective"
Stock footage of the Romulan Warbird was re-used in various episodes. One beauty shot on the main viewscreen originally from "The Neutral Zone" appeared particularly often in TNG. When the episodes were remastered for the Blu-ray release, the shots were reconstructed by different companies, with changing quality. 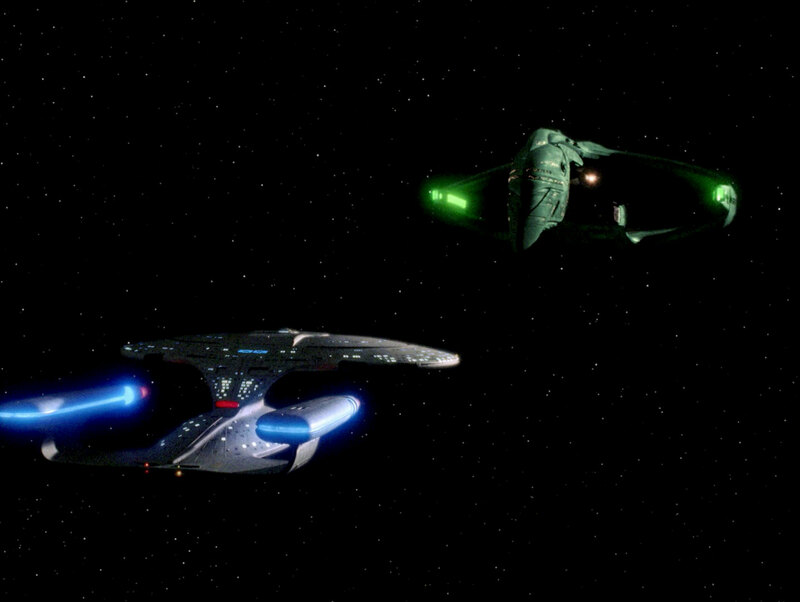 While some differences become apparent in the remastering of the shot between the seasons, it is remarkable how much even the work of one and the same company may differ from episode to episode. Here is a summary of all appearances of the Romulan Warbird and of the derived designs. 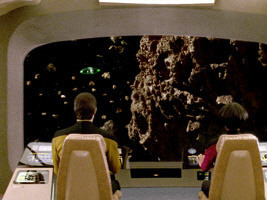 Yes, from "The Neutral Zone"
Some, from "The Neutral Zone". 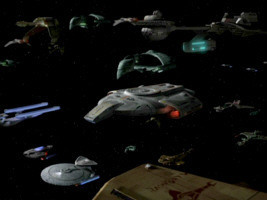 Yes, from "The Neutral Zone" and "Peak Performance"
Some, from "Contagion" and "The Defector"
Some, from "The Neutral Zone"
Yes, from "Contagion", "The Defector", "Data's Day" and "The Mind's Eye"
Some, from "Contagion" and "The Mind's Eye"
Some, from "The Mind's Eye", "Face of the Enemy"
Some, from "The Die is Cast"
Some, from "Tears of the Prophets" and "The Changing Face of Evil"